PURPOSE: A low gas-permeable silicon resin composition is provided to offer a curable material with low gas-permeability compared to a composition using phenyl-based silicone, thereby manufacturing an optical semiconductor device having excellent low gas-permeability. CONSTITUTION: A low gas-permeable silicon resin composition comprises: organopolysiloxane which is in chemical formula (1), containing two alkenyl groups in one molecule; organohydrogenpolysiloxane which is in chemical formula (2), containing at two hydrogen atoms combined with a silicon atom in one molecule; and a catalyst for addition reaction. In chemical formula (1), R^1 is independently a C6-14 aryl group, R^2 is same or different with R^1, and a substituted or non-substituted monovalent hydrocarbon group, R^3 is C2-8 alkenyl group, a is 0.3-9.9, b is 0-0.5, and c is 0.05-0.7. 본 발명은 광 반도체 소자의 밀봉재로서 유용한 저가스투과성 실리콘 수지 조성물 및 해당 조성물을 사용한 광 반도체 장치에 관한 것이다. The present invention relates to an optical semiconductor device using a low gas-permeable silicon resin composition, and the compositions are useful as sealing materials for optical semiconductor elements. 최근 들어, 광의 강도가 강하고 발열이 큰 고휘도 LED가 상품화되어, 액정 텔레비젼이나 휴대 전화의 BLU(Back Light Unit) 이외에도, 일반 조명 등에도 폭넓게 사용되어 왔다. In recent years, the intensity of light is strong and heat generation is large high-luminance LED commercialization, besides BLU (Back Light Unit) of a liquid crystal television or a mobile phone, has also been widely used for general illumination. 일본 특허 공개 제2010-1335호 공보(특허문헌 1)에는, 페닐계 실리콘 수지에 에폭시계 실리콘을 가하여, 접착성을 향상시킴으로써 내열성, 내광 안정성, 내후성이 우수한 밀봉재를 제공할 수 있다는 취지의 기재가 있다. The JP-A No. 2010-1335 (Patent Document 1), a phenyl-based, enhanced adhesion was added to the epoxy silicone in the silicone resin by heat resistance, light fastness stability and weather resistance to the effect that the substrate can provide excellent sealing material have. 또한, 일본 특허 공표 2009-527622호 공보(특허문헌 2)는 LED의 수명을 길게 하기 위해서 유용한 페닐계 레진과 직쇄상 페닐계 하이드로젠올리고오르가노실록산으로부터 구성되는 실리콘 수지 조성물을 기재하고 있다. Further, Japanese Patent Publication 2009-527622 discloses (Patent Document 2) describes a useful phenyl-based resin and a linear hydrogen-based phenyl oligonucleotide silicone resin composition comprising from organosiloxane in order to obtain longer life of the LED. LED의 패키지에는 리드 프레임이라고 불리는 동판 상에 은 도금된 것을 이용한다. Package of the LED is on is called a lead frame is used in the copper-plated. 그러나, 황분이 발생하는 사용 조건 하에서, 실리콘 수지에 의해 밀봉된 LED를 방치하면 실리콘 수지의 가스 투과성이 높기 때문에 은 표면이 황화은이 되어 흑색으로 변색하는 것이 알려져 있다. However, under the conditions used to generate sulfur minutes, allowed to stand for a LED sealed with a silicone resin due to the high gas permeability of the silicone resin is the surface of the silver sulfide is known to fade to black. 리드 프레임이 흑색화함으로써 LED의 휘도가 저하하는 것도 알고 있기 때문에, 밀봉 수지의 저가스투과성이 요구되고 있다. Since the lead frame by the black screen to know that the luminance of the LED decreases, the low gas permeability of the sealing resin has been required. 그러나, 상기 실리콘 수지는 내광성, 내열변색성, 내충격성이 우수한 한편, 페닐계 실리콘 수지에 에폭시기 등을 첨가하여 접착성을 향상시키더라도, 또한 페닐계 레진과 직쇄상 페닐계 하이드로젠올리고오르가노실록산을 조합하여 어느 정도의 신뢰성을 갖는 수지를 이용하더라도, 황화 시험에서는 실리콘 수지 중에서도 가스 투과성이 낮다는 페닐계 실리콘 수지이어도, 또한 변색하여 버린다는 것을 알 수 있었다. However, the silicon resin has light resistance and heat discoloration resistance, has excellent impact resistance, while, by the addition of an epoxy group, such as the phenyl-based silicone resin even when improve adhesion, but also phenyl-based resin and a straight-chain phenyl-based hydrogen oligonucleotide organosiloxane even if the combination of using a resin having a certain degree of reliability, the test may be phenyl sulfide-based silicone resin is the low gas permeability among the silicone resin, it was found that the color change is also discarded. 본 발명은 상기 사정을 감안하여 이루어진 것으로서, 종래의 페닐계 실리콘 수지를 이용한 조성물보다도 낮은 가스 투과성을 나타내는 광 반도체 밀봉용의 실리콘 수지 조성물 및 해당 조성물을 사용한 신뢰성이 높은 광 반도체 장치를 제공하는 것을 목적으로 한다. The invention object of the present invention is to been made in view of the above circumstances, provide a conventional-phenyl type silicone resin composition and an optical semiconductor device having high reliability using the composition for an optical semiconductor sealing exhibiting low gas permeability than the composition using the silicone resin It shall be. 본 발명자들은, 상기 목적을 달성하기 위해서 다양한 검토를 행한 결과, 말단 규소 원자에 알케닐기와 함께 아릴기를 갖는 삼차원 메쉬상 구조의 오르가노폴리실록산을 이용한 부가 반응 경화형 실리콘 수지 조성물의 경화물은 부가 반응 말단의 실에틸렌 결합의 옆에 아릴기가 존재하기 때문에, 일반적인 말단 단위가 (Me 2 ViSiO 1/2 ) 단위 등인 페닐 실리콘 수지보다도 중합체 구조가 매우 빽빽한 상태가 되어, 가스 투과성이 낮은 값을 나타내는 것을 지견하였다. 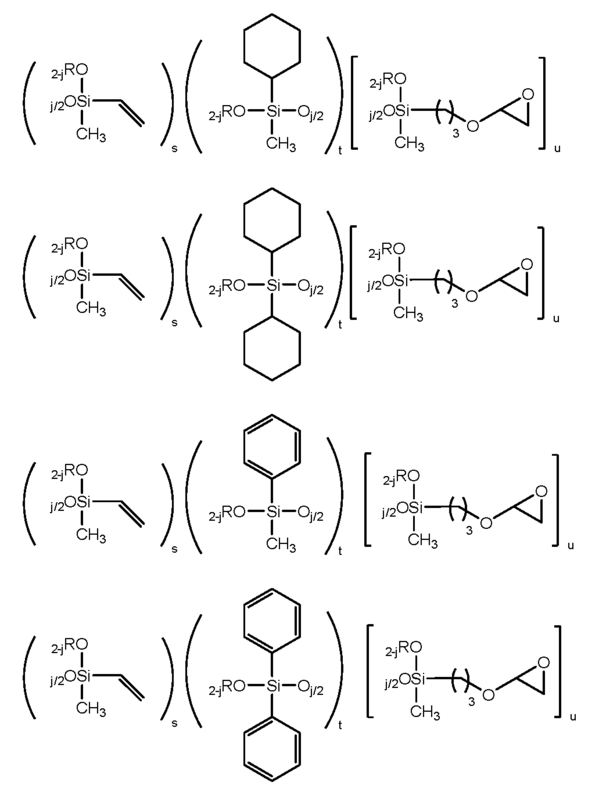 The present inventors have conducted various reviews in order to achieve the above object results, addition cured product of reaction-curable silicone resin composition obtained organopolysiloxane of the three-dimensional network structure having an aryl group with a group and alkenyl at the terminal silicon atom is an addition reaction-terminal because of the aryl groups are present to the side of the chamber an ethylene bond, and the general knowledge that the terminal unit (Me 2 ViSiO 1/2) units is a phenyl silicone resin or the like than the state of the polymer structure is very dense, showing a low gas permeability values . 또한, 상기 실리콘 수지 조성물은 종래의 실리콘 수지 조성물의 특징을 손상시키지 않고, 열이나 광에 의해 매우 부하가 걸리는 LED 패키지의 LED칩의 끝이나, 리드 프레임의 근원 등에서의 균열의 발생을 방지하는 것이 가능하게 되어, 높은 신뢰성을 나타내고, 얻어지는 경화물의 변색을 억제할 수 있는 것을 발견하였다. Further, to prevent the occurrence of a crack, etc. The silicone resin composition without impairing the characteristics of the conventional silicon resin composition, the end or origin of the lead frame of the LED chips of the LED package, it takes a very load by heat or light is possible, it has been found that exhibits high reliability and can suppress discoloration of the cured product obtained. 또한, 상기 실리콘 수지 조성물의 경화물로 광 반도체 소자(고휘도 LED 등)를 밀봉함으로써, 내변색성, 내충격성 등의 내구성이 우수한 광 반도체 장치를 제공할 수 있는 것을 발견하여, 본 발명을 완성하기에 이르렀다. In addition, by sealing an optical semiconductor element (a high luminance LED, and so on) of a cured product of the silicone resin composition, and found capable of providing a discoloration resistance, excellent durability, such as impact resistance, an optical semiconductor device, the completion of the present invention reached. 따라서, 본 발명은 하기에 나타내는 저가스투과성 실리콘 수지 조성물 및 광 반도체 장치를 제공한다. Thus, the present invention provides a low gas permeability, a silicone resin composition and an optical semiconductor device shown below. 을 함유하여 이루어지는 것을 특징으로 하는 저가스투과성 실리콘 수지 조성물. Low gas-permeable silicon resin composition which comprises a. (A) 성분 중의 알케닐기 1몰당 (B) 성분 중의 SiH기가 0.4 내지 4.0몰이 되는 양의 (B) 성분을 함유하는, 청구항 1에 기재된 실리콘 수지 조성물. (A) component in the alkenyl group per mole of (B) containing the amount of the component (B) SiH groups is 0.4 to 4.0 mol of the component, the silicone resin composition according to claim 1. (B) 성분의 50 내지 100 질량％가 하기 화학식 (3)으로 표시되는 것인, 청구항 1 또는 2에 기재된 실리콘 수지 조성물. (B) to 50 to 100% by weight of component, it is represented by the formula (3), of claim 1 or a silicone resin composition as set forth in Fig. (A') 하기 화학식 (4)로 표시되는 오르가노폴리실록산을 (A) 및 (B) 성분의 합계 100 질량부에 대하여 0.01 내지 50 질량부 더 포함하는, 청구항 1 내지 3 중 어느 한 항에 기재된 실리콘 수지 조성물. (A ') an organopolysiloxane represented by the following general formula (4) (A) and (B) disclosed in total based on 100 parts by mass of 0.01 to 50 parts by weight, further comprising, any one of claims 1 to 3 of the components a silicone resin composition. (D) 접착 부여제를 더 포함하는, 청구항 1 내지 4 중 어느 한 항에 기재된 실리콘 수지 조성물. (D) a silicone resin composition according to the adhesion-imparting agent further comprises any one of, claims 1 to 4, which. (E) 축합 촉매를 더 포함하는, 청구항 1 내지 5 중 어느 한 항에 기재된 실리콘 수지 조성물. (E) a silicone resin composition as set forth in any one of a condensation catalyst, the claims 1 to 5, further comprising. (F) 무기질 충전제를 더 포함하는, 청구항 1 내지 6 중 어느 한 항에 기재된 실리콘 수지 조성물. (F) a silicone resin composition as set forth in further comprising an inorganic filler, any one of claims 1 to 6. 두께 1 mm의 경화물의 수증기 투과율이 15 g/m 2 ?day 이하인, 청구항 1 내지 7 중 어느 한 항에 기재된 실리콘 수지 조성물. Water vapor permeability of the cured product having a thickness of 1 mm is 15 g / m 2? Day or less, the silicone resin composition according to any one of claims 1 to 7. 광 반도체 소자의 밀봉용인, 청구항 1 내지 8 중 어느 한 항에 기재된 실리콘 수지 조성물. Sealing of the optical semiconductor element tolerated, the silicone resin composition according to any one of claims 1 to 8. 청구항 1 내지 8 중 어느 한 항에 기재된 실리콘 수지 조성물의 경화물로 광 반도체 소자가 밀봉된 광 반도체 장치. It claims 1 to 8 of the sealed optical semiconductor device, the optical semiconductor device of a cured product of the silicone resin composition according to any of the preceding. 본 발명에 따르면, (A) 성분 중의 말단에 존재하는 아릴기가, 입체 장해가 되어 가스 투과성을 낮게 한다는 이점에 의해 저가스투과성 실리콘 수지 조성물을 제공할 수 있다. According to the invention, it is an aryl group, steric hindrance present in the terminal of the component (A) may provide a low gas-permeable silicon resin composition by the advantage of low gas permeability. 이하, 본 발명에 대해서 상세히 설명한다. Will now be described in detail the invention. 본 발명의 (A) 성분은, 하기 평균 조성식 (1)로 표시되고, 1 분자 중에 2개 이상의 알케닐기를 함유하는 실리콘 수지이다. Component (A) of the present invention, is represented by the following average composition formula (1), a silicone resin containing at least two alkenyl group in the molecule. 상기 평균 조성식 (1)에 있어서, R 1 은 탄소수 6 내지 14의 아릴기이고, 페닐기, 톨릴기, 크실릴기, 나프틸기 등의 아릴기 등을 들 수 있으며, 특히 페닐기인 것이 바람직하다. In the above average composition formula (1), R 1 may be exemplified an aryl group having 6 to 14, a phenyl group, a tolyl group, a xylyl group, a naphthyl group of the aryl group or the like, particularly preferably phenyl group. R 2 는 R 1 과 동일 또는 상이한, 비치환 또는 치환된 1가 탄화수소기이고, 바람직하게는 지방족 불포화 결합을 제외하는 탄소수 1 내지 10, 특히 탄소수 1 내지 6의 1가 탄화수소기이다. R 2 is R 1, the same or different, unsubstituted or substituted monovalent hydrocarbon group, preferably a monovalent group having 1 to 10 carbon atoms, especially having 1 to 6 carbon atoms, a hydrocarbon group excluding an aliphatic unsaturated bond. 이러한 R 2 로서는, 메틸기, 에틸기, 프로필기, 이소프로필기, 부틸기, 이소부틸기, tert-부틸기, 펜틸기, 네오펜틸기, 헥실기, 옥틸기, 노닐기, 데실기 등의 알킬기; Examples of the R 2, a methyl group, an ethyl group, a propyl group, an isopropyl group, a butyl group, an isobutyl group, tert- butyl group, a pentyl group, neopentyl group, hexyl group, octyl group, an alkyl group such as a nonyl group, a decyl group; 시클로펜틸기, 시클로헥실기 등의 시클로알킬기; Cycloalkyl groups such as cyclopentyl group, cyclohexyl group; R 1 과 같이 페닐기, 톨릴기, 크실릴기, 나프틸기 등의 아릴기; An aryl group such as phenyl group, tolyl group, and xylyl group, a naphthyl group as R 1; 벤질기, 페닐에틸기, 페닐프로필기 등의 아르알킬기, 및 이들 기의 수소 원자의 일부 또는 전부를 불소, 브롬, 염소 등의 할로겐 원자, 시아노기 등으로 치환한 것, 예를 들면 클로로메틸기, 클로로프로필기, 브로모에틸기, 트리플루오로프로필기 등의 할로겐 치환 알킬기, 및 시아노에틸기 등의 시아노기 치환 알킬기 등을 들 수 있다. A benzyl group, a phenylethyl group, it is substituted with an aralkyl group, and some or all of the hydrogen atoms of these groups fluorine, bromine, chlorine, such as a halogen atom, a cyano group such as phenylpropyl group, for chloromethyl group, chloro g. there may be mentioned propyl group, a bromo group, a halogen-substituted alkyl groups such as propyl group trifluoromethyl, cyano and cyano-substituted alkyl groups such as a no-group and the like. 상기 평균 조성식 (1)에 있어서, R 3 은 탄소수 2 내지 8, 바람직하게는 탄소수 2 내지 6의 알케닐기이다. In the above average composition formula (1), R 3 is an alkenyl group having 2 to 8 carbon atoms, preferably from 2 to 6 carbon atoms. 이러한 R 3 으로서는, 비닐기, 알릴기, 프로페닐기, 이소프로페닐기, 부테닐기, 헥세닐기, 시클로헥세닐기, 옥테닐기 등을 들 수 있으며, 비닐기 또는 알릴기가 바람직하다. 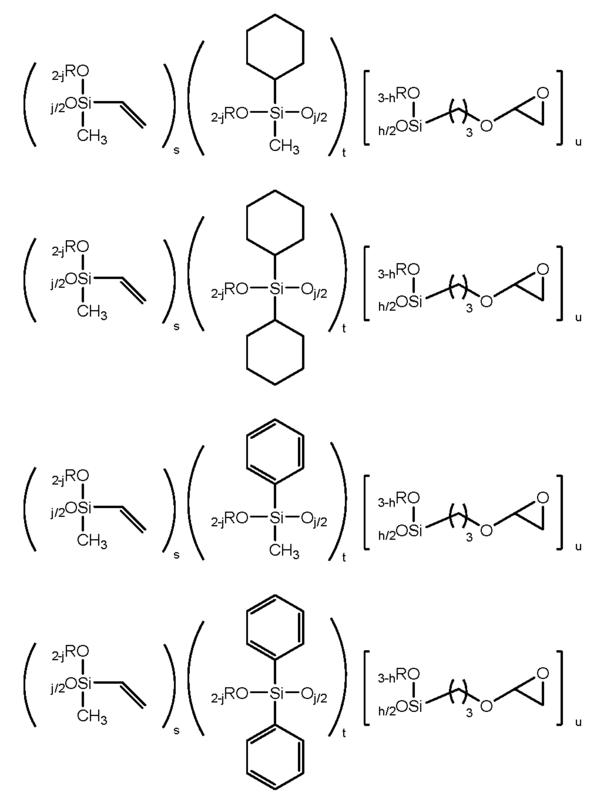 Examples of such R 3, may be made of vinyl, allyl, propenyl, isopropenyl group, butenyl group, hexenyl group, cyclohexenyl group, okte group or the like, preferably a vinyl or allyl. 또한, 상기 평균 조성식 (1)로 표시되는 오르가노폴리실록산의 1 분자 중에 함유하는 알케닐기는 2개 이상이고, 상기 오르가노폴리실록산에 포함되는 알케닐기 함유량은 0.001 내지 0.2 mol/100 g, 특히 0.005 내지 0.1 mol/100 g로 하는 것이 바람직하다. Further, the alkenyl group is at least 2, which contain in the molecule of the organopolysiloxane represented by the average composition formula (1), the alkenyl group content contained in the organopolysiloxane is from 0.001 to 0.2 mol / 100 g, especially from 0.005 to to a 0.1 mol / 100 g it is preferable. 또한, a는 0.3 내지 0.9, 바람직하게는 0.5 내지 0.8, b는 0 내지 0.5, 바람직하게는 0 내지 0.2, c는 0.05 내지 0.7, 바람직하게는 0.05 내지 0.4의 양수이되, 단 a+b+c=1.0이다. In addition, a is from 0.3 to 0.9, preferably from 0.5 to 0.8, b is from 0 to 0.5, preferably 0 to 0.2, c is 0.05 to 0.7, preferably from 0.05 to 0.4 being yangsuyi, with the proviso that a + b + c a = 1.0. 본 발명에서는, 상기 (A) 성분과 함께 하기 (A') 성분을 사용할 수 있다. In the present invention, it is possible to use the above-mentioned (A) together with component (A ') component. (A') 성분의 오르가노폴리실록산은, 주쇄가 디오르가노실록산 단위((R') 2 SiO 2 /2 단위)의 반복을 포함하고, 분자쇄 양쪽 말단이 트리오르가노실록시기((R') 3 SiO 1 /2 단위)로 봉쇄된 직쇄상 구조를 갖는 오르가노폴리실록산인 것이 일반적이다. 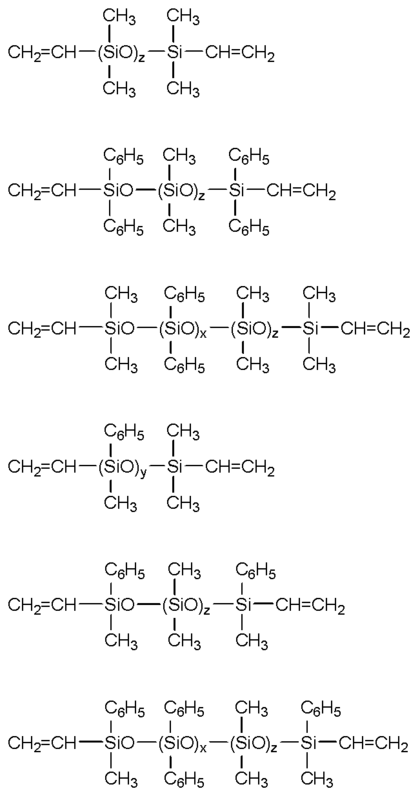 (A ') organopolysiloxane of the component, the main chain are diorganosiloxane units ((R') 2 SiO 2 /2 unit) repeat, and the molecular chain both ends of the tree organo siloxy ((R 'include a) it is common 3 SiO the organopolysiloxane having a straight chain structure, blocked with 1/2 units). 또한, 상기 식에 있어서, R'는 독립적으로 비치환 또는 치환된 바람직하게는 탄소수 1 내지 10, 보다 바람직하게는 탄소수 1 내지 3의 1가 탄화수소기이고, 구체적으로는 메틸기, 에틸기, 프로필기, 이소프로필기, 부틸기, 이소부틸기, tert-부틸기, 펜틸기, 네오펜틸기, 헥실기 등의 알킬기, 시클로헥실기 등의 시클로알킬기, 비닐기, 알릴기, 프로페닐기 등의 알케닐기, 페닐기, 톨릴기, 크실릴기 등의 아릴기, 벤질기, 페닐에틸기, 페닐프로필기 등의 아르알킬기 등이나, 이들 기의 수소 원자의 일부 또는 전부가 불소, 브롬, 염소 등의 할로겐 원자, 시아노기 등으로 치환된 것, 예를 들면 클로로메틸기, 클로로프로필기, 브로모에틸기, 트리플루오로프로필기, 시아노에틸기 등을 들 수 있다. In the above formula, R 'is independently unsubstituted or substituted by preferably from 1 to 10 carbon atoms, more preferably a group 1 of 1 to 3 carbon atoms hydrocarbon group, specifically, methyl group, ethyl group, propyl group, an isopropyl group, a butyl group, an isobutyl group, tert- butyl group, a pentyl group, a neopentyl group, a hexyl alkenyl group such as an alkyl group, a cyclohexyl group, such as cycloalkyl group, vinyl group, allyl group, propenyl group, such groups, phenyl group, tolyl group, xylyl group, and the like of the aryl group, benzyl group, phenylethyl group, phenylpropyl group and the like aralkyl groups, such as and, these groups a halogen atom, such as some or all of fluorine, bromine, chlorine of the hydrogen atoms of the cyano of It is substituted by group such as, for example, a chloromethyl group, chloropropyl group, a bromo group, a propyl group, a cyano group, such as trifluoromethyl. 그 중에서도 하기 화학식 (4)로 표시되는 분자쇄 양쪽 말단의 규소 원자 상에 각 1개 이상의 비닐기를 갖는 직쇄상 오르가노폴리실록산으로서, 25℃에서의 점도가 10 내지 1,000,000 mPa?s, 바람직하게는 1,000 내지 50,000 mPa?s인 것이 작업성, 경화성 등의 관점에서 바람직하다. 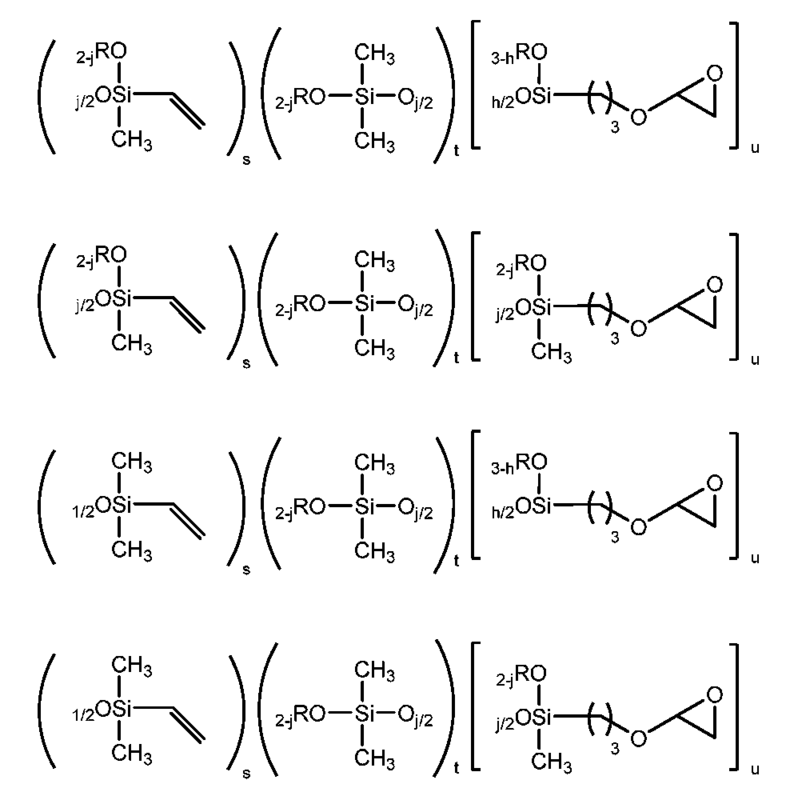 To inter alia a straight-chain organopolysiloxane having the general formula (4) the molecular chain vinyl on the silicon atom at least one each of both ends represented by the following groups, 10 has a viscosity at 25 ℃ to 1,000,000 mPa? S, preferably 1,000 that the to 50,000 mPa? s is preferable in view of workability, curability. 점도는, 예를 들면 회전 점도계에 의해 측정할 수 있다(이하, 동일). The viscosity is, for example, can be measured by a rotational viscometer (hereinafter the same). 또한, 이 오르가노폴리실록산은 소량의 분지상 구조(삼관능성 실록산 단위)를 분자쇄 중에 함유할 수도 있다. 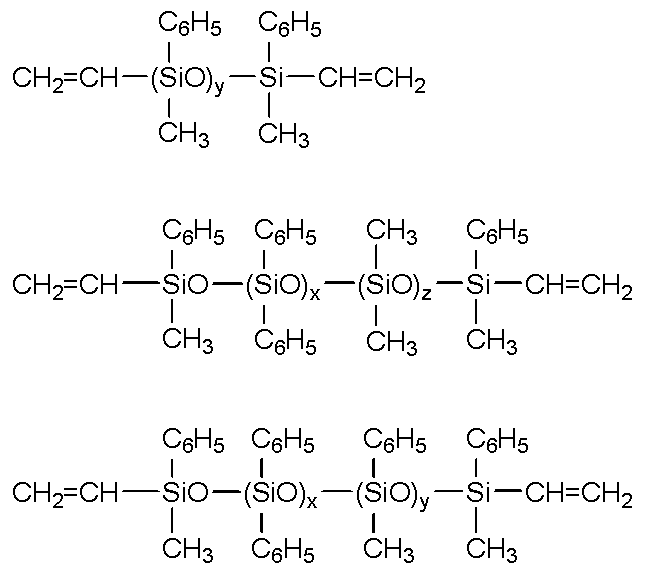 In addition, the organopolysiloxane has a small amount of branched structures (trifunctional siloxane units) could be contained in the molecular chain. 상기 화학식 (4)에 있어서, R 4 는 R 1 과 동일 또는 상이한, 비치환 또는 치환된 1가 탄화수소기이고, R 2 와 동일한 것을 예시할 수 있다. In the general formula (4), R 4 is R 1, the same or different, unsubstituted or substituted monovalent hydrocarbon group can be exemplified the same as the R 2.
x, y 및 z는 1≤x+y+z≤1,000을 만족하는 0 또는 양의 정수이고, 바람직하게는 5≤x+y+z≤500, 보다 바람직하게는 30≤x+y+z≤500이되, 단 0.5<(x+y)/(x+y+z)≤1.0을 만족하는 정수이다. x, y and z are 1≤x + y + 0 or a positive integer satisfying the z≤1,000, preferably 5≤x + y + z≤500, more preferably 30≤x + y + z≤ 500 provided that, with the proviso that 0.5 <(x + y) / (x + y + z) is an integer satisfying ≤1.0. 이러한 상기 화학식 (4)로 표시되는 오르가노폴리실록산으로서는, 구체적으로 하기의 것을 들 수 있다. 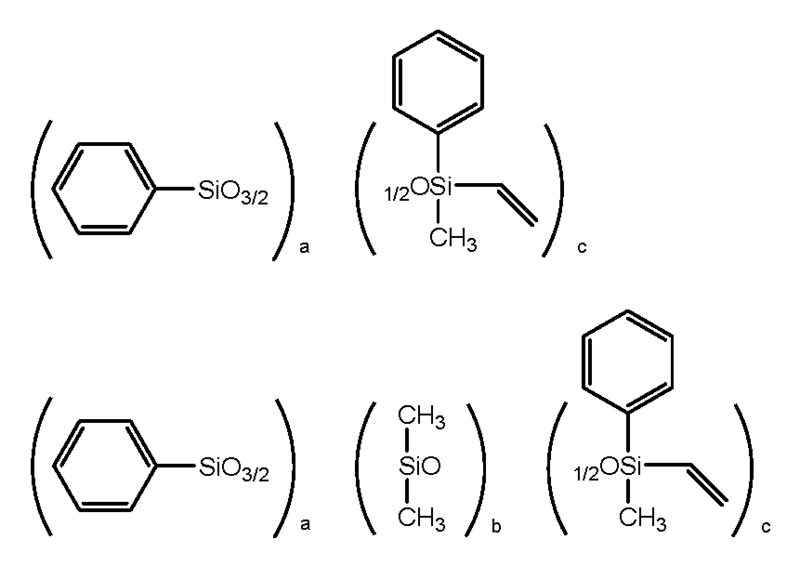 Examples of the organopolysiloxane represented by this formula (4), those of the following in detail. (A') 성분을 이용하는 경우의 배합량은, (A) 성분 100 질량부에 대하여 0.01 내지 50 질량부인 것이 바람직하고, 보다 바람직하게는 10 내지 30 질량부이다. (A ') The amount of the case of using the components, (A) component, and based on 100 parts by mass of 0.01 to 50 parts by mass is preferable, and more preferably 10 to 30 parts by weight. (A') 성분의 배합량이 너무 많으면, 수지 표면에 끈적임(태크성)이 생기거나, 가스 투과성이 높아져 버리는 경우가 있다. (A ') the amount of the component is too high, the resin surface stickiness (tack properties) is introduced or in some cases the gas permeability becomes high ll. 본 발명의 (A) 성분은, 레진 구조(즉, 삼차원 메쉬상 구조)의 오르가노폴리실록산이고, (A') 성분은 직쇄상의 오르가노폴리실록산이고, 이들 오르가노폴리실록산은 R 6 SiO 1 .5 단위, R 5 k R 6 p SiO 단위 및 R 5 q R 6 r SiO 0 .5 단위(상기 식에 있어서, R 5 는 독립적으로 비닐기 또는 알릴기이고, R 6 은 독립적으로 비치환 또는 치환된 지방족 불포화 결합을 포함하지 않는 1가 탄화수소기이고, k는 0 또는 1, p는 1 또는 2의 정수이되, 단 k+p=2이고, q는 1, r은 2의 정수임)의 1종 또는 2종 이상의 오르가노폴리실록산으로부터 형성할 수 있다. Component (A) of the present invention, the organopolysiloxane of the resin structure (namely, three-dimensional mesh-like structure), (A ') component is an organopolysiloxane of straight-chain, these organopolysiloxanes R 6 SiO 1 .5 units, r 5 r 6 p k according to the SiO units, and r 5 q r 6 r SiO 0 .5 unit (the above formula, r 5 is a vinyl group or an allyl group independently, r 6 are independently unsubstituted or substituted a monovalent hydrocarbon group that contains no aliphatic unsaturated bonds, k is 0 or 1, p is 1 or 2, being an integer, and the stage k + p = 2, q is 1, r is one or a numeral from 2) It can be formed from an organopolysiloxane of two or more thereof. 또한, R 6 으로서는 상기 R 2 에서 예시한 것과 동일한 기를 들 수 있고, 그 중에서도 페닐기인 것이 바람직하다. In addition, R 6 As may be mentioned the same groups as those exemplified in the above R 2, among them preferably a phenyl group. 레진 구조의 오르가노폴리실록산은, R 6 SiO 1 .5 단위를 a' 단위, R 5 k R 6 p SiO 단위를 b' 단위, R 5 q R 6 r SiO 0 .5 단위를 c' 단위로 한 경우, 몰비로 (b'+c')/a'=0.01 내지 2, 바람직하게는 0.1 내지 1.2, c'/a'=0.05 내지 2, 바람직하게는 0.1 내지 1.0이 되는 양으로 구성되어 있는 것이 바람직하다. The organopolysiloxane resin of the structure, R 6 SiO 1 .5 units to a 'units, R 5 R 6 k SiO units to p b' by the units, R 5 R 6 r SiO q 0 .5 units to c 'units case, it is configured in an amount of molar ratio (b '+ c') is a / a '= 0.01 to 2, preferably 0.1 to 1.2, c' / a '= 0.05 to 2, preferably from 0.1 to 1.0 desirable. 또한, 상기 오르가노폴리실록산은, GPC에 의한 폴리스티렌 환산의 중량 평균 분자량이 500 내지 10,000, 특히 1,000 내지 4,000의 범위에 있는 것이 바람직하다. In addition, the organopolysiloxane is preferably in the range of the weight average molecular weight in terms of polystyrene by GPC 500 to 10,000, especially 1,000 to 4,000. 레진 구조의 오르가노폴리실록산은, 상기 a' 단위, b' 단위, c' 단위의 단위원이 되는 화합물을 상기 몰비가 되도록 조합하고, 예를 들면 산의 존재 하에서 공가수분해 반응을 행함으로써 용이하게 합성할 수 있다. Organopolysiloxanes of the resin structure is facilitated by performing the above a 'unit, b' units, c 'combined such that the compound of the unit circle of the units that the molar ratio, and for example, ball hydrolysis reaction in the presence of an acid It can be synthesized. 또한, 직쇄상의 오르가노폴리실록산도 b' 및 c' 단위원을 이용하여 마찬가지로 합성할 수 있다. Further, FIG organopolysiloxane of straight-chain can be synthesized similarly by using the b 'and c' unit circle. a' 단위원으로서는, 페닐트리클로로실란, 페닐트리메톡시실란, 페닐트리에톡시실란, 시클로헥실트리클로로실란, 시클로헥실트리메톡시실란, 시클로헥실트리에톡시실란, 시클로펜틸트리클로로실란, n-프로필트리클로로실란, 메틸트리클로로실란, 메틸트리메톡시실란, 메틸트리에톡시실란 등을 사용할 수 있다. As a 'unit circle, silane and phenyl trichloro silane, phenyl trimethoxy silane, diethoxy silane, cyclohexyl-trichloro phenyl triethoxy silane, cyclohexyl trimethoxy silane, silane, cyclopentyl trichloro the cyclohexyl tree, n - can be a propyl trichloro silane, methyltrichlorosilane using silane, methyl trimethoxysilane, methyl triethoxysilane, etc. silane. b' 단위원으로서는 하기의 것을 사용할 수 있다. b as "unit circle may be the following. c' 단위원으로서는 하기의 것을 사용할 수 있다. As the c 'unit circle may be the following. 상기 평균 조성식 (1)로 표시되는 오르가노폴리실록산으로서, 구체적으로는 하기에 나타내는 것을 예시할 수 있다. An organopolysiloxane represented by the average composition formula (1), there can be mentioned that the shown below specifically. 하기 식 중, a, b, c는 상기와 동일하다. Of the following formula, a, b, c are defined as above. 본 발명의 (B) 성분인 오르가노하이드로젠폴리실록산은 가교제로서 작용하는 것이고, 상기 성분 중의 규소 원자에 결합한 수소 원자(이하, SiH기)와 (A) 성분 중의 알케닐기가 부가 반응함으로써 경화물을 형성한다. Is to effect the organohydrogenpolysiloxane of the present invention component (B) is a cross-linker, a hydrogen atom (hereinafter, SiH groups) bonded to silicon atoms within the component and of the cured product by group addition reaction of the alkenyl in component (A) forms. 상기 오르가노하이드로젠폴리실록산은 하기 평균 조성식 (2)로 표시되고, 1 분자 중에 적어도 2개의 규소 원자 결합 수소 원자를 함유하는 것이다. The organohydrogenpolysiloxane is to contain at least two silicon atom-bonded hydrogen atom in the to be displayed by the average formula (2), one molecule. 상기 평균 조성식 (2)에 있어서, R 1 , R 2 는 상술한 R 1 , R 2 에서 예시한 것을 들 수 있는데, 탄소수 1 내지 7의 1가 탄화수소기인 것이 바람직하고, 예를 들면 메틸기 등의 탄소수 1 내지 3의 저급 알킬기, 페닐기 등의 아릴기 등을 들 수 있고, 특히 R 1 , R 2 중 페닐기를 포함하는 것이 바람직하다. In the above average composition formula (2), R 1, R 2 are carbon atoms, such as may include those exemplified in the above R 1, R 2, has one of 1 to 7 carbon atoms, for preferable, and for example, a hydrocarbon group a methyl group lower alkyl group of 1 to 3, there may be mentioned aryl groups such as phenyl group and the like, it is preferred to include a particular R 1, R 2 of the phenyl group. 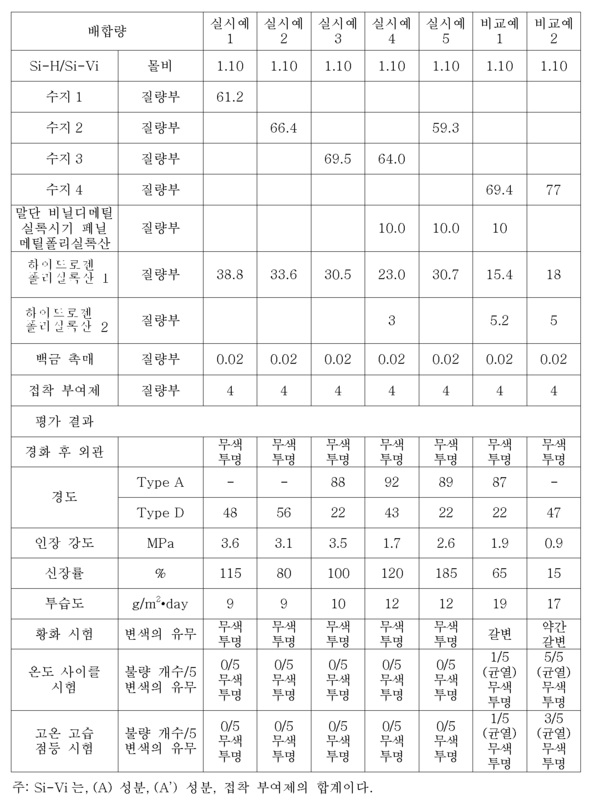 또한, d는 0.6 내지 1.5, 바람직하게는 0.6 내지 1.4, e는 0 내지 0.5, 바람직하게는 0 내지 0.4, f는 0.4 내지 1.0, 바람직하게는 0.4 내지 0.8의 양수이되, 단 d+e+f=1.0 내지 2.5, 바람직하게는 1.5 내지 2.4를 만족시킨다. Also, d is 0.6 to 1.5, preferably 0.6 to 1.4, e is from 0 to 0.5, preferably 0 to 0.4, f is 0.4 to 1.0, preferably being 0.4 to 0.8 yangsuyi, provided that d + e + f = 1.0 to 2.5, thereby preferably satisfies 1.5 to 2.4. 분자 중 SiH기의 위치는 특별히 제한되지 않고, 분자쇄의 말단이거나 도중일 수도 있다. Position of the SiH groups in its molecule is not particularly limited and may be a terminal or the middle of the molecular chain. 본 발명에서는, (B) 성분인 오르가노하이드로젠폴리실록산 중 50 질량％ 이상, 특히 50 내지 100 질량％, 특히 60 내지 90 질량％가 말단에 SiH기를 2개 갖고, 일부 분지를 가질 수도 있는 직쇄상의 오르가노하이드로젠폴리실록산인 것이 바람직하다. In the present invention, (B) component, organo hydrogen having 50 mass% or more, particularly 50 to 100% by weight, in particular 60 to the SiH to the terminal 90 mass% of a group 2 of a polysiloxane, a straight chain which may have some branching that of the organohydrogenpolysiloxane is preferred. 이 직쇄상 오르가노하이드로젠폴리실록산으로서는, 하기 화학식 (3)으로 표시되는 것이다. As the straight-chain organohydrogenpolysiloxane, to be represented by the formula (3). 상기 화학식 (3) 중, R 1 , R 2 는 상기한 바와 같고, 상술한 R 1 , R 2 에서 예시한 것을 들 수 있다. In the formula (3), R 1, R 2 are as described above, include those exemplified in the above R 1, R 2. 상기 (B1) 성분 이외의 오르가노하이드로젠폴리실록산으로서는, 1 분자 중에 SiH기를 적어도 3개, 바람직하게는 3 내지 10개, 보다 바람직하게는 3 내지 6개 갖는, 바람직하게는 분지상의 오르가노하이드로젠폴리실록산이 바람직하게 이용된다. As the organohydrogenpolysiloxane other than the component (B1), one at least three groups SiH in the molecule, preferably 3 to 10, more preferably 3 to 6 having, preferably branched organosiloxane Hyde the halogenated polysiloxane is preferably used. 분자 중의 SiH기의 위치는 특별히 제한되지 않고, 분자쇄의 말단이거나 도중일 수도 있다. Position of SiH groups in the molecule is not particularly limited and may be a terminal or the middle of the molecular chain. 이 오르가노하이드로젠폴리실록산은 임의 성분이고, (B) 성분인 오르가노하이드로젠폴리실록산 중, 50 질량％ 미만, 특히 0 내지 30 질량％ 배합할 수 있고, 필요에 따라서는 가하지 않을 수도 있다. The organohydrogenpolysiloxane is an optional component, (B) an organohydrogenpolysiloxane of, less than 50% by weight, in particular may be added 0 to 30% by weight of component, and may apply, depending on the need. 이상과 같은 오르가노하이드로젠폴리실록산으로서는, 트리스(디메틸하이드로젠실록시)메틸실란, 트리스(디메틸하이드로젠실록시)페닐실란, 1,1,3,3-테트라메틸디실록산, 1,3,5,7-테트라메틸시클로테트라실록산, 양쪽 말단 트리메틸실록시기 봉쇄 메틸하이드로젠폴리실록산, 양쪽 말단 트리메틸실록시기 봉쇄 디메틸실록산?메틸하이드로젠실록산 공중합체, 양쪽 말단 디메틸하이드로젠실록시기 봉쇄 디메틸실록산?메틸하이드로젠실록산 공중합체, 양쪽 말단 트리메틸실록시기 봉쇄 메틸하이드로젠실록산?디페닐실록산 공중합체, 양쪽 말단 트리메틸실록시기 봉쇄 메틸하이드로젠실록산?디페닐실록산?디메틸실록산 공중합체, (CH 3 ) 2 HSiO 1 /2 단위와 SiO 4 /2 단위를 포함하는 공중합체, (CH 3 ) 2 HSiO 1 /2 단위와 SiO 4 /2 단위와 (C 6 H 5 )SiO 3 /2 단위를 포함하는 Or more as an organohydrogenpolysiloxane, such as, tris (dimethyl hydrogen siloxy) methylsilane, tris (dimethyl hydrogen siloxy) phenylsilane, 1,1,3,3-tetramethyldisiloxane, 1,3,5 , 7-tetramethyl cyclotetrasiloxane, both ends trimethylsiloxy group blocked methylhydrogen polysiloxane, trimethyl siloxy group at both ends blocked dimethylsiloxane? 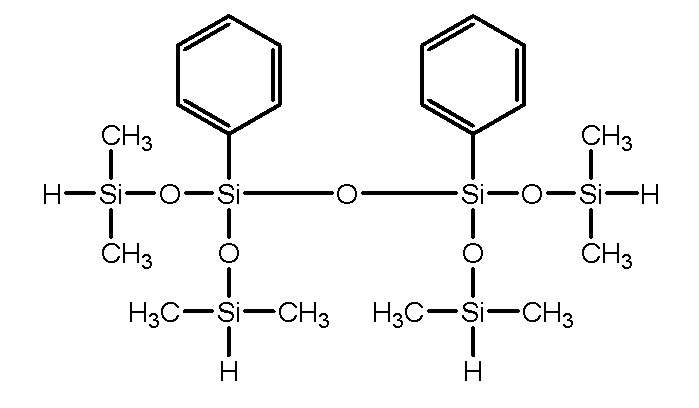 methylhydrogen siloxane copolymers, both ends of a dimethyl hydrogen siloxy group blocked dimethylsiloxane? methylhydrogen copolymers, both end trimethylsiloxy group blocked methylhydrogen siloxane? 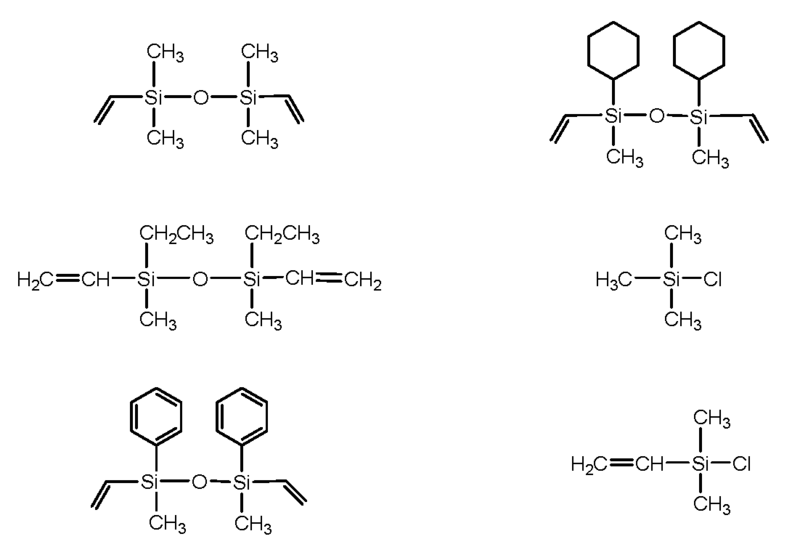 diphenylsiloxane copolymers, both end trimethylsiloxy group blocked methylhydrogen siloxane? diphenylsiloxane? 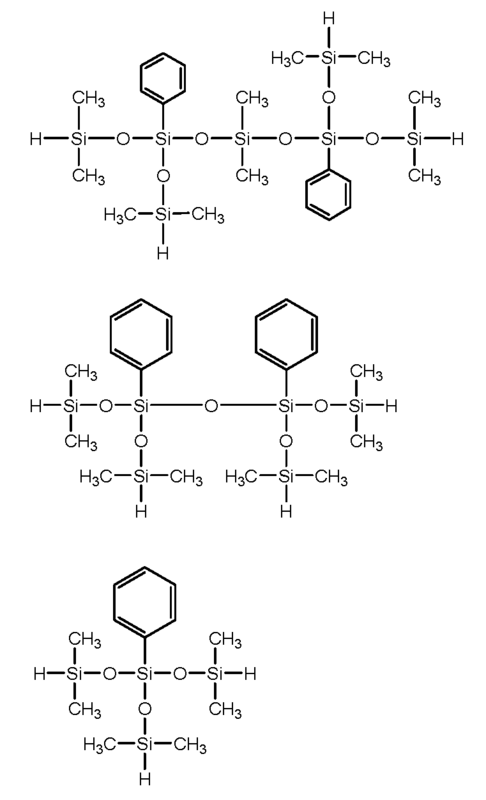 dimethylsiloxane copolymer, (CH 3) 2 HSiO 1 /2 copolymers comprising units and SiO 4/2 units, (CH 3) 2 HSiO 1 /2 units and SiO 4/2 units and (C 6 H 5) containing SiO 3/2 units 공중합체 등을 들 수 있다. And the like can be mentioned copolymers. 또한, 하기 식으로 표시되는 오르가노하이드로젠폴리실록산도 사용할 수 있다. It is also possible to use an organohydrogenpolysiloxane represented by the following formula. 이 오르가노하이드로젠폴리실록산의 분자 구조는, 직쇄상, 환상, 분지상, 삼차원 메쉬상 구조 중의 어느 것이어도 되지만, 1 분자 중의 규소 원자의 수(또는 중합도)가 3 내지 100, 바람직하게는 3 내지 10인 것을 사용하는 것이 좋다. The molecular structure of the organohydrogenpolysiloxane is a straight chain, cyclic, branched, three-dimensional mesh-like structure, but may be any of, a number of silicon atoms in the molecule (or degree of polymerization) is 3 to 100, preferably 3 to it is recommended to use in that 10. 이러한 오르가노하이드로젠폴리실록산은 공지된 방법에 의해 제조할 수 있고, 통상 R 7 SiHCl 2 , (R 7 ) 3 SiCl, (R 7 ) 2 SiCl 2 , (R 7 ) 2 SiHCl(R 7 은, 비치환 또는 치환된 지방족 불포화 결합을 포함하지 않는 1가 탄화수소기이고, 상기 R 6 과 동일한 것을 예시할 수 있음)과 같은 클로로실란을 가수분해축합하거나, 가수분해축합하여 얻어진 실록산을, 강산 촉매를 이용하여 평형화함으로써 얻을 수 있다. This organohydrogenpolysiloxane may be prepared by known methods, typically R 7 SiHCl 2, (R 7 ) 3 SiCl, (R 7) 2 SiCl 2, (R 7) 2 SiHCl (R 7 is a Beach a group 1 does not contain a ring or a substituted aliphatic unsaturation hydrocarbon, using a siloxane wherein R 6 may be mentioned the same ones as) and the chlorosilane hydrolysis condensation or like, obtained by hydrolysis and condensation, a strong acid catalyst and it can be obtained by equilibration. 또한, 이와 같이 하여 얻어지는 오르가노하이드로젠폴리실록산은, 말단 규소 원자에 수소 원자만이 아니라, 수산기나 알콕시기(원료의 알콕시실란을 이용한 경우)가 잔존, 함유하고 있는 경우가 있고, 본 발명은 이것을 그대로 사용할 수 있는데, 이 경우 상기 수산기 및 알콕시기 치환량은 규소 원자 결합 수소 원자와 규소 원자 결합 수산기와 규소 원자 결합 알콕시기의 합계량의 0.1 내지 8 몰％가 바람직하고, 더욱 바람직하게는 1 내지 7 몰％이다. Further, in this manner there is obtained an organohydrogenpolysiloxane, if containing, hydroxyl group, not only the hydrogen atoms at the terminal silicon atoms, an alkoxy group (the case of using an alkoxysilane in the raw material) remains, the present invention is this as it may be used, in which case the hydroxyl group and an alkoxy group substitution is a silicon atom to which a 0.1 to 8 mol% of the total amount of hydrogen atoms and the silicon atom to which a hydroxyl group and a silicon atom-bonded alkoxy groups are preferred, and more preferably 1 to 7 mol %to be. 상기 치환기량이 상기 수치보다 많으면, 말단이 알콕시기나 수산기의 실록산이 많이 존재하게 되어, 신뢰성 시험 등을 행했을 때, 열이나 광이 강한 조건이나 수분이 많이 존재하는 조건 등에서는, 접착 보조제로서의 기능보다는, 실록산 결합을 절단하거나 함으로써, 밀봉재 내에 균열이 발생하거나 패키지의 은과의 계면에서 박리가 발생하는 등 신뢰성의 저하를 야기하는 경우가 있다. Etc. condition that the substitution amount is more than the figure, the terminal is an alkoxy group or is to exist many siloxane group for a hydroxyl group, when performing the reliability test or the like, there are many sources of heat and light is a strong condition and moisture has a function as a bonding aid rather, in some cases, by cutting a siloxane bond, or a crack occurs in the sealing material, or cause a deterioration of reliability, such as interface exfoliation occurs in the package is. 또한, (B) 성분의 오르가노하이드로젠폴리실록산은, 수소 가스 발생량이 70 내지 200 ml/g인 것이 바람직하다. Also, (B) organohydrogenpolysiloxane of the component, it is preferable that the hydrogen gas generation amount of 70 to 200 ml / g.
이 오르가노하이드로젠폴리실록산(B)의 배합량은 상기 (A) 및 (A') 성분의 경화 유효량으로서, 특히 그의 SiH기가 (A) 및 (A') 성분 중의 알케닐기(예를 들면 비닐기)의 합계량당 0.5 내지 4.0, 특히 바람직하게는 0.8 내지 2.0, 더욱 바람직하게는 0.9 내지 1.5의 몰비로 사용되는 것이 바람직하다. "As a curing effective amount of a component, in particular his SiH groups (A) and (A a rise amount of the organosiloxane hydrogen polysiloxane (B) is (A) above and (A) 'an alkenyl group of) component (e.g. a vinyl group) a is from 0.5 to 4.0, especially preferably per the total amount is preferably used in a molar ratio of 0.8 to 2.0, more preferably 0.9 to 1.5. 상기 하한치 미만이면, 경화 반응이 진행하지 않아 경화물을 얻는 것이 곤란하고, 상기 상한치 초과이면 미반응된 SiH기가 경화물 중에 다량으로 잔존하기 때문에, 고무 물성이 경시적으로 변화하는 원인이 되는 경우가 생긴다. If it is less than the lower limit, the curing reaction and is difficult to obtain a cured product does not proceed, the case because the remaining in a large amount in the cured product group is the upper limit value greater than if the unreacted SiH, the rubber physical properties to cause varying with time It occurs. 또한, 후술하는 임의 성분인 (D) 성분의 접착 부여제로서, 알케닐기를 함유하는 화합물을 이용하는 경우, (B) 성분 중의 SiH기가 (A), (A') 및 (D) 성분 중의 알케닐기의 합계량당 0.5 내지 4.0, 특히 바람직하게는 0.8 내지 2.0, 더욱 바람직하게는 0.9 내지 1.5의 몰비로 사용되는 것이 바람직하다. Further, as a given adhesive of (D) an optional component described below ingredient claim, in the case of using a compound containing alkenyl groups, (B) groups SiH in component (A), (A ') and (D) an alkenyl in component group a is from 0.5 to 4.0, especially preferably per the total amount is preferably used in a molar ratio of 0.8 to 2.0, more preferably 0.9 to 1.5. (A), (A') 및 (B) 성분 중의 페닐기 함유량은, (A), (A') 및 (B) 성분의 합계 질량에 대하여 20 질량％ 이상 50 질량％ 이하, 바람직하게는 30 질량％ 이상 45 질량％ 이하인 것이 좋다. (A), (A ') and (B) a phenyl group content in the components, (A), (A') and (B) at least 20% by weight based on the total weight of the composition of 50% by mass or less, preferably 30 parts by mass %, preferably less than 45% by weight. 20 질량％ 미만이면 가스 투과성이 증대하여, LED 패키지 내의 은면을 부식하여 LED의 휘도 저하로 이어지는 경우가 있다. 20 to increase the gas permeability is less than mass%, there is a case to the hidden surface corrosion in the LED package, leading to a lowering of luminance LED. 또한 페닐기 함유량이 너무 많으면 내열성이나 내광성이 부족하게 되는 경우가 있다. In addition, there is a case that it is too high phenyl group content is insufficient in heat resistance and light resistance. 또한, 후술하는 임의 성분인 (D) 성분의 접착 부여제로서, 페닐기를 함유하는 화합물을 이용하는 경우, 상기 (A), (A') 및 (B) 성분과 (D) 성분 중의 페닐기 함유량이 (A), (A'), (B) 및 (D) 성분의 합계 질량에 대하여 20 내지 50 질량％, 바람직하게는 30 내지 45 질량％인 것이 바람직하다. 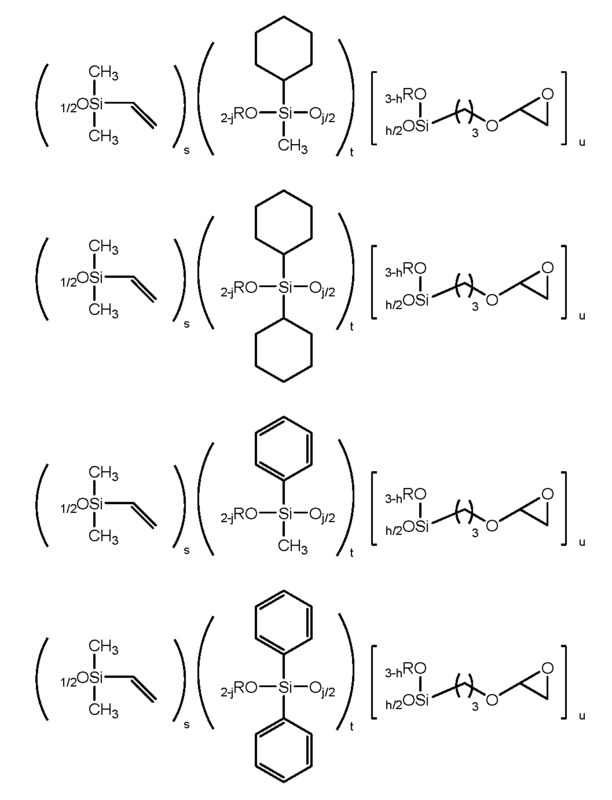 In addition, when a given adhesive of any component of the component (D) to be described later first, using a compound containing a phenyl group, a phenyl group content of the (A), (A ') and component (B) and the component (D) is ( a), that the (a '), (B) and (D) 20 to 50% by weight based on the total weight of the composition, preferably 30 to 45 mass% is preferred. (C) 성분의 부가 반응용 촉매는, (A) 성분 중의 알케닐기와 (B) 성분 중의 SiH기와의 부가 반응을 촉진하기 위해서 배합되고, 백금계, 팔라듐계, 로듐계의 촉매를 사용할 수 있는데, 비용 등의 견지로부터 백금족 금속계 촉매인 것이 좋다. (C) an addition reaction catalyst of the component, (A) is blended in order to promote the addition reaction of the SiH groups of the alkenyl group of component (B) in the component, the platinum-based, palladium-based, it may be used a catalyst of rhodium-based preferably, the platinum group metal-based catalyst from the viewpoint of cost. 백금족 금속계 촉매로서는, 예를 들면 H 2 PtCl 6 ?mH 2 O, K 2 PtCl 6 , KHPtCl 6 ?mH 2 O, K 2 PtCl 4 , K 2 PtCl 4 ?mH 2 O, PtO 2 ?mH 2 O(m은 양의 정수) 등을 들 수 있다. As the platinum group metal-based catalyst, for example, H 2 PtCl 6? MH 2 O , K 2 PtCl 6, KHPtCl 6? MH 2 O, K 2 PtCl 4, K 2 PtCl 4? MH 2 O, PtO 2? MH 2 O ( and the like and m is a positive integer). 또한, 상기 백금족 금속계 촉매와 올레핀 등의 탄화수소, 알코올 또는 비닐기 함유 오르가노폴리실록산과의 착체 등을 사용할 수 있다. You may also use a complex, etc. of the platinum group metal-based catalyst and the olefin, such as hydrocarbons, alcohols, or vinyl group-containing organopolysiloxane. 상기 촉매는 1종 단독이거나 2종 이상의 조합이어도 된다. The catalysts may be singly or in combination of two or more thereof. 부가 반응용 촉매는, 이른바 촉매량으로 배합하면 되고, 통상 상기 (A) 및 (B) 성분의 합계량 100 질량부에 대하여 백금족 금속 환산(질량)으로, 바람직하게는 0.0001 내지 2 질량부, 보다 바람직하게는 0.0001 내지 0.05 질량부가 되는 양으로 사용된다. The addition reaction catalyst is, and when formulated in so-called catalytic amount, typically the (A) and (B) a platinum group metal in terms of (mass) based on 100 parts by mass of the total of components, preferably from 0.0001 to 2 parts by mass, and more preferably It is used in an amount to be added from 0.0001 to 0.05 wt. 본 발명의 실리콘 수지 조성물은, 상술한 (A) 내지 (C) 성분 이외에, 추가로 접착 부여제 (D)를 배합할 수도 있다. Silicone resin composition of the present invention, in addition to the above-described (A) to (C) components, may be added to give additional adhesion to the (D). 접착 부여제로서는, 비닐트리메톡시실란, 비닐트리에톡시실란, 2-(3,4-에폭시시클로헥실)에틸트리메톡시실란, 3-글리시독시프로필트리메톡시실란, 3-글리시독시프로필메틸디에톡시실란, 3-글리시독시프로필트리에톡시실란, 3-메타크릴옥시프로필메틸디메톡시실란, 3-메타크릴옥시프로필트리메톡시실란, 3-메타크릴옥시프로필메틸디에톡시실란, 3-메타크릴옥시프로필트리에톡시실란, N-2(아미노에틸)3-아미노프로필메틸디메톡시실란, N-2(아미노에틸)3-아미노프로필트리메톡시실란, N-2(아미노에틸)3-아미노프로필트리에톡시실란, 3-아미노프로필트리메톡시실란, 3-아미노프로필트리에톡시실란, N-페닐-3-아미노프로필트리메톡시실란, 3-머캅토프로필트리메톡시실란 등의 실란 커플링제나, 트리메톡시실란, 테트라메톡시실란 및 그의 올리고머 등을 들 수 As the adhesion-imparting agent, vinyl trimethoxysilane, vinyl triethoxysilane, 2- (3,4-epoxycyclohexyl) ethyltrimethoxysilane, 3-glycidoxypropyltrimethoxysilane, 3-glycidoxy methyl diethoxy silane, 3-glycidoxypropyltrimethoxysilane to the silane, 3-methacryloxypropyl methyl dimethoxysilane, 3-methacryloxypropyl trimethoxysilane, 3-methacryloxypropyl methyl diethoxysilane, 3-methacryloxy propyl triethoxysilane to, N-2 (aminoethyl) 3-aminopropyl methyl dimethoxysilane, N-2 (aminoethyl) 3-aminopropyltrimethoxysilane, N-2 (aminoethyl) a 3-aminopropyl triethoxysilane, and 3-aminopropyltrimethoxysilane, 3-aminopropyl a silane, N- phenyl-3-aminopropyltrimethoxysilane, 3-mercaptopropyl trimethoxysilane of the silane coupling agent, silane, and the like tetramethoxysilane and its oligomers 있다. have. 또한, 하기 식으로 표시되는 1 분자 중에 비닐기, 에폭시기, 규소 원자에 결합한 알콕시기, 규소 원자에 결합한 수산기로부터 선택되는 1종 또는 2종 이상의 기를 갖는 유기 규소 화합물을 들 수 있다. In addition, to be a vinyl group, an epoxy group, an organic silicon compound having an alkoxy group bonded to silicon atom, the silicon atom a hydroxyl group of one or more selected from binding to the molecule of the formula. 이들 중에서도, 하기 식으로 표시되는 접착 부여제를 이용하는 것이 바람직하다. Among these, it is preferable to use an adhesion imparting agent to be represented by the following formula. 이들 접착 부여제는, 1종 단독으로나 2종 이상 혼합하여 사용할 수도 있다. These adhesion-imparting agent is, at least alone or may be used by mixing two or more kinds. 접착 부여제는 (A) 내지 (C) 성분의 합계 질량에 대하여 0 내지 10 질량％, 특히 0 내지 5 질량％가 되는 양으로 배합하는 것이 바람직하고, 배합하는 경우에는 1 질량％ 이상으로 하는 것이 바람직하다. When the adhesive imparting agent (A) to (C) based on the total weight from 0 to 10% by weight of the components, especially preferably blended in an amount of from 0 to 5% by weight and compounding is not less than 1% by weight desirable. 접착 부여제의 배합량이 너무 많으면 균열이 발생하거나, 밀봉재로서의 신뢰성이 저하되는 경우가 있다. When the amount of the adhesion-imparting agent is too high, cracking, or in some cases the reliability of the sealing material is deteriorated. 축합 촉매는 (B) 성분의 분자 사이에서의 가수분해축합 반응 및 (B) 성분과 기판 표면에 존재하는 수산기와의 축합 반응을 촉진하기 위해서 배합한다. Condensation catalyst is blended in order to promote the condensation reaction with the hydroxyl groups present in the hydrolysis and condensation reaction and the component (B) and the substrate surface between the molecules of the component (B). 축합 촉매로서는, 디라우르산주석, 디라우르산디n-부틸주석, 디옥토에이트주석비스(2-에틸헥사노에이트)주석, 비스(네오데카노에이트)주석, 디-n-부틸디아세톡시주석 및 테트라부틸주석 등의 주석(II) 및 주석(IV) 화합물, 및 티탄테트라이소프로폭시드, 티탄테트라옥톡시드, 티탄테트라n-부톡시드, 티탄부톡시드 이량체, 티탄테트라-2-에틸헥속시드, 티탄디이소프로폭시비스(아세틸아세토네이트), 티탄디옥틸옥시비스(옥틸렌글리콜레이트), 티탄디이소프로폭시비스(에틸아세토아세테이트) 등의 티탄 화합물, 알루미늄트리스아세틸아세토네이트, 알루미늄트리스아세트리아세테이트, 트리스(sec-부톡시)알루미늄 등의 알루미늄 화합물, 니켈비스아세틸아세토네이트 등의 니켈 화합물, 코발트트리스아세틸아세토네이트 등의 코발트 화합물, 아연비스아세 As the condensation catalyst, dilauryl tin Ur acid, dilauryl Ur di n- butyltin, di octoate tin bis (2-ethylhexanoate) tin, bis (neodecanoate) tin, di -n- butyl diacetoxy tin and tetra-butyl tin, such as tin (II) and tin (IV) compounds, and titanium tetraisopropoxide, titanium tetra oktok oxide, titanium tetra-n- butoxide, titanium butoxide dimer, titanium tetra-2-ethylhexoxy of oxide, titanium di-isopropoxy-bis (acetylacetonate), titanium di-octyloxy-bis (octylene glycolate), titanium di-isopropoxy bis (ethylacetoacetate), such as a titanium compound, aluminum tris acetylacetonate, aluminum tris acetate triacetate, tris (sec- butoxy) aluminum and the aluminum compounds, nickel compounds such as nickel bis-acetyl acetonate, cobalt tris-acetyl compounds such as cobalt acetonate, zinc bis acetate 아세토네이트 등의 아연 화합물, 지르코늄테트라노르말프로폭시드, 지르코늄테트라노르말부톡시드, 지르코늄테트라아세틸아세토네이트, 지르코늄트리부톡시모노아세틸아세토네이트, 지르코늄모노부톡시아세틸아세토네이트, 지르코늄디부톡시비스(에틸아세토아세테이트), 지르코늄테트라아세틸아세토네이트, 지르코늄트리부톡시모노스테아레이트 등의 지르코늄 화합물을 들 수 있다. Acetonitrile zinc compounds such as carbonate, zirconium tetra n-propoxide, zirconium tetra-n-butoxide, zirconium tetra acetyl acetonate, zirconium tree-butoxy mono acetyl acetonate, zirconium mono-butoxy acetylacetonate, zirconium dibutoxy bis (ethyl acetoacetate acetate), there may be mentioned zirconium compounds such as zirconium tetra acetylacetonate, zirconium tree butoxy monostearate. 상기 축합 촉매는 1종 단독이거나 2종 이상의 조합이어도 된다. The condensation catalyst may be alone or in combination of two or more thereof. 특히 내변색성이 높고, 반응성이 풍부한 지르코늄계 촉매의 오르가틱스 ZA 시리즈((주)마츠모토 코쇼 제조)를 이용하는 것이 바람직하다. In particular, high discoloration resistance, it is preferred to use Organic ticks ZA series (Co., Ltd. Preparation Matsumoto kosyo) of the reactive-rich zirconium based catalyst. (E) 성분을 사용하는 경우의 배합량은, (A), (B) 성분의 합계 100 질량부에 대하여 0.0001 내지 1 질량부, 바람직하게는 0.0001 내지 0.1 질량부가 되는 양으로 사용된다. The blending amount in the case of using the (E) component, (A), (B) is used in the total 100 parts by weight of 0.0001 to 1 part by mass with respect to, the amount is preferably from 0.0001 to 0.1 part by mass of the component. 상기 상한치 초과이면 경화물의 변색의 원인이 되는 경우가 있고, 상기 하한치 미만이면 접착 촉진 효과가 낮아지는 경우가 있다. In some cases the upper limit value is exceeded and if the cause of the discoloration of the cured, is less than the lower limit of the adhesion promotion effect is lowered. 본 발명의 실리콘 수지 조성물은, 상술한 (A) 내지 (E) 성분 이외에, 필요에 따라서 공지된 각종 첨가제를 배합할 수 있다. Silicone resin composition of the present invention, in addition to the above-described (A) to (E) components, may be blended with various known additives as needed. 각종 첨가제로서는, 퓸드 실리카, 퓸드 이산화티탄 등의 보강성 무기질 충전제, 탄산칼슘, 규산칼슘, 이산화티탄, 산화제2철, 카본블랙, 산화아연 등의 비보강성 무기질 충전제 등의 무기질 충전제 (F), 힌더드 아민 등의 광 열화 방지제, 비닐에테르류, 비닐아미드류, 에폭시 수지, 옥세탄류, 알릴프탈레이트류, 아디프산비닐 등의 반응성 희석제 등을 들 수 있다. As the various additives, it fumed silica, fumed inorganic filler such as titanium dioxide, such as reinforcing inorganic filler, calcium carbonate, calcium silicate, titanium dioxide, oxidizing iron, carbon black, inorganic vivo rigidity, such as zinc oxide filler (F), the hinge hindered can be given a light degradation preventing agent, vinyl ethers, vinyl amides, epoxy resins, oxetane acids, allyl phthalates, Oh-reactive diluent, such as adipic acid, such as vinyl amine. 이들 각종 첨가제는 본 발명의 목적을 손상시키지 않는 범위에서 적절하게 배합할 수 있다. These various additives may be appropriately blended within the range that does not impair the object of the present invention. 또한, 페닐계 실리콘은 디메틸 실리콘에 비하여 내열성이 나쁘기 때문에, 산화 방지제를 적절하게 배합할 수 있다. In addition, the phenyl silicone-based, because poor heat resistance compared to the dimethyl silicone, may be appropriately blended antioxidants. 이러한 산화 방지제로서는, 펜타에리트리톨테트라키스[3-(3,5-디-t-부틸-4-히드록시페닐)프로피오네이트], N,N'-프로판-1,3-디일비스[3-(3,5-디-tert-부틸-4-히드록시페닐)프로피오나미드], 티오디에틸렌비스[3-(3,5-디-tert-부틸-4-히드록시페닐)프로피오네이트], 옥타데실-3-(3,5-디-t-부틸-4-히드록시페닐)프로피오네이트, 6,6'-디-tert-부틸-2,2'-티오디-p-크레졸, N,N'-헥산-1,6-디일비스[3-(3,5-디-tert-부틸-4-히드록시페닐프로피온아미드)], 벤젠프로판산, 3,5-비스(1,1-디메틸에틸)-4-히드록시, C7-C9 측쇄 알킬에스테르, 디에틸[[3,5-비스(1,1-디메틸에틸)-4-히드록시페닐]메틸]포스포네이트, 2,2'-에틸리덴비스[4,6-디-tert-부틸페놀], 3,3',3",5,5',5"-헥사-tert-부틸-a,a',a"-(메시틸렌-2,4,6-트리일)트리-p-크레졸, 칼슘디에틸비스[[[3,5-비스(1,1-디메틸에틸)-4-히드록시페닐]메틸]포스포네이트],4,6- As such an antioxidant, pentaerythritol tetrakis [3- (3,5-di -t- butyl-4-hydroxyphenyl) propionate], N, N'- propane-1,3-diyl-bis [3 - (3,5-di -tert- butyl-4-hydroxyphenyl) pro Fiona imide], thiodiethylene bis [3- (3,5-di -tert- butyl-4-hydroxyphenyl) propionate ], octadecyl-3- (3,5-di -t- butyl-4-hydroxyphenyl) propionate, 6,6'-di -tert- butyl-2,2'-thiodiethylene -p- cresol , N, N'- hexane-1,6-diyl-bis [3- (3,5-di -tert- butyl-4-hydroxyphenyl propionamide)] benzene propanoic acid, 3,5-bis (1, l-dimethylethyl) -4-hydroxy, C7-C9 branched alkyl esters, diethyl [[3,5-bis (1,1-dimethylethyl) -4-hydroxyphenyl] methyl] phosphonate, 2, 2,2'-ethylidene-bis [4,6-di -tert- butyl phenol], 3,3 ', 3 ", 5, 5', 5" - hexahydro -tert- butyl -a, a ', a "- ( mesitylene-2,4,6-yl) -p- tree-cresol, calcium diethyl bis [[[3,5-bis (1,1-dimethylethyl) -4-hydroxyphenyl] methyl] phosphonate -, 4,6 비스(옥틸티오메틸)-o-크레졸, 4,6-비스(도데실티오메틸)-o-크레졸, 에틸렌비스(옥시에틸렌)비스[3-(5-tert-부틸-4-히드록시-m-톨릴)프로피오네이트], 헥사메틸렌비스[3-(3,5-디-tert-부틸-4-히드록시페닐)프로피오네이트, 1,3,5-트리스(3,5-디-tert-부틸-4-히드록시벤질)-1,3,5-트리아진-2,4,6-트리온, 1,3,5-트리스[(4-tert-부틸-3-히드록시-2,6-크실릴)메틸]-1,3,5-트리아진-2,4,6(1H,3H,5H)-트리온, 6,6'-디-tert-부틸-4,4'-티오디-m-크레졸, 디페닐아민, N-페닐벤젠아민과 2,4,4-트리메틸펜텐의 반응 생성물, 2,6-디-tert-부틸-4-(4,6-비스(옥틸티오)-1,3,5-트리아진-2-일아미노)페놀, 3,4-디히드로-2,5,7,8-테트라메틸-2-(4,8,12-트리메틸트리데실)-2H-1-벤조피란-6-올, 2',3-비스[[3-[3,5-디-tert-부틸-4-히드록시페닐]프로피오닐]]프로피오노히드라지드, 디도데실3,3'-티오디프로피오네이트, 디옥타데실3,3'-티오디 Bis (octyl thiomethyl) -o--cresol, 4,6-bis (dodecyl thiomethyl) -o- cresol, ethylenebis (oxyethylene) bis [3- (5-tert- butyl-4-hydroxy -m -tolyl) propionate], hexamethylene bis [3- (3,5-di -tert- butyl-4-hydroxyphenyl) propionate, 1,3,5-tris (3,5-di -tert -butyl-4-hydroxybenzyl) -1,3,5-triazine-2,4,6-one, 1,3,5-tris [(4-tert- butyl-3-hydroxy-2, 6-xylyl) methyl] -1,3,5-triazine -2,4,6 (1H, 3H, 5H) - tree-one, 6,6'-di -tert- butyl-4,4'-T Audi -m- cresol, diphenylamine, N- benzene amine and the reaction product of 2,4,4-trimethyl-pentene, 2,6-di -tert- butyl 4- (4,6-bis (octylthio) 1,3,5-triazin-2-ylamino) phenol, 3,4-dihydro -2,5,7,8- tetramethyl-2- (4,8,12- trimethyl-tridecyl) -2H -1-benzopyran-6-ol, 2 ', 3-bis [[3- [3,5-di -tert- butyl-4-hydroxyphenyl] propionyl]] propionyl hydrazide Ono, didodecyl 3, 3'-thiodipropionate, dioctadecyl 3,3'-thiodiglycol 프로피오네이트 등이 예시된다. Such as propionate and the like. 또한, 바람직하게는 이르가녹스(Irganox) 245, 259, 295, 565, 1010, 1035, 1076, 1098, 1135, 1130, 1425WL, 1520L, 1726, 3114, 5057(바스프(BASF) 재팬(주)) 등을 들 수 있다. Further, preferably Irganox (Irganox) 245, 259, 295, 565, 1010, 1035, 1076, 1098, 1135, 1130, 1425WL, 1520L, 1726, 3114, 5057 (BASF (BASF) Japan Co., Ltd.) and the like. 이들의 산화 방지제는 1종 단독으로나 2종 이상을 혼합하여 이용할 수도 있다. These antioxidants may be used in combination of two or more thereof alone or 1 species. 실리콘 수지 조성물은, 상술한 각 성분을 동시에 또는 따로따로, 필요에 따라 가열 처리를 가하면서 교반, 용해, 혼합 및 분산시킴으로써 제조되는데, 통상은 사용 전에 경화 반응이 진행하지 않도록, (A), (B) 및 (C) 성분과, (B) 및 (D) 성분을 2액으로 나눠 보존하고, 사용 시에 상기 2액을 혼합하여 경화를 행한다. A silicone resin composition, the above-described each of the components simultaneously or separately, there is produced by and is a heat treatment as needed, stirring, melting, mixing and dispersion, it is usually not the curing reaction to proceed prior to use, (A), ( B) and (C) is carried out with the component, (B) and (D) curing a mixture of the two liquids, in use, divide the retention component with two liquids, and. 예를 들면, (C) 성분과 (D) 성분을 1액으로 보존하면 탈수소 반응을 일으킬 위험성이 있기 때문에, (C) 성분과 (D) 성분을 나눠 보존하는 것이 좋다. For example, because there is the risk to cause dehydrogenation Retaining the (C) component and the (D) component in the first liquid, it is better to divide the retention component (C) and (D) components. 또한, 아세틸렌 알코올 등의 경화 억제제를 소량 첨가하여 1액으로 하여 이용할 수도 있다. It is also possible to add a small amount of a curing inhibitor such as acetylene alcohol used in the first liquid. 교반 등의 조작에 이용하는 장치는 특별히 한정되지 않지만, 교반, 가열 장치를 구비한 분쇄기, 3축 롤, 볼밀, 플라네터리 믹서 등을 사용할 수 있다. Apparatus using an operation such as stirring is not particularly limited, and can be used to stir, having a heating device mill, three-roll mill, a ball mill, a planetary mixer or the like. 또한, 이들 장치를 적절하게 조합하여도 된다. It is also possible to properly combine these devices. 또한, 얻어진 실리콘 수지 조성물의 회전 점도계에 의해 측정한 25℃에서의 점도는, 100 내지 10,000,000 mPa?s, 특히 300 내지 500,000 mPa?s 정도인 것이 바람직하다. Further, the viscosity at a 25 ℃ measured by a rotational viscometer of the resulting silicone resin composition, it is of about 100 to 10,000,000 mPa? S, in particular from 300 to 500,000 mPa? S is preferred. 이와 같이 하여 얻어지는 실리콘 수지 조성물은, 필요에 따라서 가열함으로써 즉시 경화하고, 높은 투명성을 갖고, 또한 LCP 등의 패키지 재료나 금속 기판에 매우 잘 접착되기 때문에, 광 반도체 소자의 밀봉재로서 유효하고, 광 반도체 소자로서는, 예를 들면 LED, 포토다이오드, CCD, CMOS, 포토 커플러 등을 들 수 있고, 특히 LED의 밀봉재로서 유효하다. Thus, the silicone resin composition obtained is heated, if necessary, and immediately cured, has a high transparency, and because very well adhered to the package material or a metal substrate, such as LCP, effective as a sealing material for optical semiconductor elements and optical semiconductor as the device, for example, there may be mentioned LED, photodiodes, CCD, CMOS, photocoupler, etc., is particularly useful as a sealing material for LED. 본 발명의 실리콘 수지 조성물의 경화물에 의한 광 반도체 장치의 밀봉 방법은 광 반도체 소자의 종류에 따라 공지된 방법을 채용할 수 있다. Sealing method for an optical semiconductor device according to the cured product of the silicone resin composition of the present invention there may be employed a known method depending on the type of optical semiconductor device. 여기서, 본 발명의 실리콘 수지 조성물의 경화 조건은 특별히 제한되는 것이 아니지만, 통상 40 내지 250℃, 바람직하게는 60 내지 200℃에서, 5분 내지 10시간, 바람직하게는 30분 내지 6시간 정도로 경화시킬 수 있다. Here, the curing conditions of the silicone resin composition of the present invention is not particularly limited, and the normal 40 to 250 ℃, preferably from 60 to 200 ℃, cured to about 5 minutes to 10 hours, preferably 30 minutes to 6 hours can. 은 도금한 리드 프레임에 밀봉하는 경우, 은 도금한 리드 프레임은 상기 실리콘 수지 조성물의 습윤성을 높이기 위해서 미리 표면 처리를 하여 두는 것이 바람직하다. Is the case for sealing a lead frame plated, silver-plated lead frame which is preferable to the surface-treated beforehand in order to increase the wettability of the silicone resin composition. 이러한 표면 처리는 작업성이나 설비의 보전 등의 관점에서, 자외선 처리, 오존 처리, 플라즈마 처리 등의 건식법이 바람직하고, 특히 플라즈마 처리가 바람직하다. This surface treatment is in terms of maintenance of the workability or the equipment, and a dry method such as ultraviolet treatment, ozone treatment, plasma treatment preferred, especially preferred is plasma treatment. 또한, 프리몰드 패키지의 재질은 실리콘 수지 조성물의 상용성을 높이기 위해서 프리몰드 패키지 중의 실리콘 성분의 함유량이 전체 유기 성분의 15 질량％ 이상으로 하는 것이 바람직하다. In addition, the pre-molded material of the package, it is preferred that the pre-mold when the content of the silicon component in the package for at least 15% by weight of the total organic components in order to improve the compatibility of the silicone resin composition. 여기에 말하는 실리콘 성분이란 Si 단위를 갖는 화합물 및 그 중합체로 정의되는 것으로서, 실리콘 성분이 전체 유기 성분의 15 질량％ 미만이면, 실리콘 수지 조성물과의 상용성이 저하되기 때문에, 수지 밀봉할 때 실리콘 수지 조성물과 프리몰드 패키지 내벽 사이에 간극(공포; 空泡)이 생겨 버려, 균열의 생기기 쉬운 광 반도체 장치로 되어 버리기 때문에 바람직하지 않다. As being here a silicon component talking to is defined as a compound and a polymer having an Si units, if the silicon component is less than 15% by weight of the total organic components, since the compatibility with the silicone resin composition is lowered, the silicone resin when the sealing resin composition and the gap between the pre-molded package wall (horror; 空泡) is discarded blossomed, it is not preferable because the dumping to occur in an easy optical semiconductor device of the crack. 본 발명의 실리콘 수지 조성물은, 두께 1 mm의 경화물로 한 경우의 수증기 투과율이 15 g/m 2 ?day 이하, 특히 1 내지 15 g/m 2 ?day, 특히 5 내지 15 g/m 2 ?day인 것이 바람직하다. Silicone resin composition of the present invention, the water vapor permeability in a case where a cured product with a thickness of 1 mm is 15 g / m 2? Day or less, and particularly 1 to 15 g / m 2? Day, in particular from 5 to 15 g / m 2? that the day is preferred. 여기서, 본 발명의 실리콘 수지 조성물의 수증기 투과율을 상기 값으로 하기 위해서는, 상기 비닐레진 (A)의 말단 아릴비닐기 함유 실록산 단위의 양을 20 mol％ 이상으로 하는 것이 바람직하다. Here, to the water vapor permeability of the silicone resin composition of the present invention as the value, it is preferable that the amount of the terminal aryl vinyl group-containing siloxane units of the vinyl resin (A) with more than 20 mol%. 또한, 수증기 투과율은 JIS K 7129에 준거하여 리시(Lyssy)법(장치명 리시(Lyssy)사 L80-5000)에 의해 측정할 수 있다. In addition, the water vapor permeability can be measured by the receiver (Lyssy) method (device name receiver (Lyssy) four L80-5000) in accordance with JIS K 7129. 본 발명의 실리콘 수지 조성물의 경화물은 가스 투과성이 낮고, 상기 경화물에 의해 밀봉하여 얻어지는 광 반도체 장치는 경화물의 변색이 억제되어, 반사 효율의 내구성이 우수한 광 반도체 장치가 된다. The cured product of the silicone resin composition of the present invention has a low gas permeability, optical semiconductor device and the light obtained by sealing the cargo is a cured product of discoloration is suppressed and the durability of reflective efficiency is excellent in the optical semiconductor device. 이하, 실시예 및 비교예를 나타내고, 본 발명을 구체적으로 설명하는데, 본 발명은 하기의 실시예로 제한되는 것이 아니다. Represents the following examples and comparative examples, to illustrate the present invention in detail, the invention is not limited to the following examples. 플라스크에 크실렌 718 g, 물 2,571 g을 가하고, 페닐트리클로로실란 1,269.6 g(6.00 mol), 비스(메틸페닐비닐실록산) 621.08 g(2.00 mol), 크실렌 1,078 g을 혼합한 것을 적하하였다. Was added to 718 g of xylene, 2,571 g of water in a flask, was added dropwise a mixture of the silane 1,269.6 g (6.00 mol), bis (phenyl vinyl siloxane) 621.08 g (2.00 mol), xylene, 1,078 g of phenyl trichloro. 적하 종료 후 3시간 교반하고, 폐산분리하고 수세하였다. After completion of the dropwise addition was stirred for 3 hours, and the spent acid separated and washed with water. 공비 탈수 후에 50 질량％ KOH 수용액 19.26 g(0.172 mol)을 가하고, 내온 150℃에서 철야 가열 환류를 행하였다. After azeotropic dehydration was added a 50 mass% KOH aqueous solution of 19.26 g (0.172 mol), it was subjected to heating overnight under reflux at an internal temperature of 150 ℃. 트리메틸클로로실란 31.7 g(0.293 mol), 아세트산칼륨 28.7 g(0.293 mol)으로 중화하고, 여과 후 용제를 감압증류 제거하고, 메탄올로 세정하고 다시 증류 제거하여, 하기 평균 조성식으로 표시되는 실록산 수지(수지 1)를 합성하였다. Trimethylchlorosilane 31.7 g (0.293 mol), potassium acetate 28.7 g siloxane resin (resin that is neutralized with (0.293 mol), and was evaporated under reduced pressure, the solvent was filtered, and represented by the following by washing with methanol and evaporated again, and the average composition formula 1) was synthesized. 얻어진 실록산 수지의 GPC에 의한 폴리스티렌 환산의 중량 평균 분자량은 1,400이고, 비닐 당량은 0.233 mol/100 g이었다. The weight-average molecular weight in terms of polystyrene by GPC of the obtained siloxane resin is 1,400, a vinyl equivalent of 0.233 mol / 100 g.
플라스크에 크실렌 1,142 g, 물 4,629 g을 가하고, 페닐트리클로로실란 2,285 g(10.8 mol), 비스(메틸페닐비닐실록산) 718.7 g(2.31 mol), 크실렌 1,712 g을 혼합한 것을 적하하였다. Was added to 1,142 g of xylene, 4,629 g of water in a flask, was added dropwise to a mixture phenyl trichloro silane 2,285 g (10.8 mol), bis (phenyl vinyl siloxane) 718.7 g (2.31 mol), xylene, 1,712 g. 적하 종료 후 3시간 교반하고, 폐산분리하고 수세하였다. After completion of the dropwise addition was stirred for 3 hours, and the spent acid separated and washed with water. 공비 탈수 후에 50 질량％ KOH 수용액 20.64 g(0.184 mol)을 가하고, 내온 150℃에서 철야 가열 환류를 행하였다. After azeotropic dehydration was added to 20.64 g (0.184 mol) 50 wt% KOH aqueous solution, it was subjected to heating overnight under reflux at an internal temperature of 150 ℃. 트리메틸클로로실란 34.0 g(0.313 mol), 아세트산칼륨 30.7 g(0.313 mol)으로 중화하고, 여과 후 용제를 감압증류 제거하고, 메탄올로 세정하고 다시 감압증류 제거하여, 하기 평균 조성식으로 표시되는 실록산 수지(수지 2)를 합성하였다. Trimethylchlorosilane 34.0 g (0.313 mol), potassium acetate 30.7 g siloxane resin which is neutralized with (0.313 mol), and after filtration the solvent was evaporated under reduced pressure, and represented by the following by washing with methanol and again evaporated under reduced pressure, the average composition formula ( ethylamine resin 2). 얻어진 실록산 수지의 GPC에 의한 폴리스티렌 환산의 중량 평균 분자량은 1,770이고, 비닐 당량은 0.186 mol/100 g이었다. And 1770 has a weight average molecular weight in terms of polystyrene by GPC of the obtained siloxane resin, a vinyl equivalent of 0.186 mol / 100 g.
플라스크에 크실렌 1,050 g, 물 5,096 g을 가하고, 페닐트리클로로실란 2,285 g(10.8 mol), 디메틸디클로로실란 199 g(1.54 mol), 비스(메틸페닐비닐실록산) 479 g(1.54 mol), 크실렌 1,576 g을 혼합한 것을 적하하였다. In the flask and xylene, 1,050 g, the water 5,096 g, a silane 2,285 g (10.8 mol), dimethyldichlorosilane 199 g (1.54 mol), bis (phenyl vinyl siloxane) 479 g (1.54 mol), xylene, 1,576 g of phenyl trichloro It was dropped a mixture. 적하 종료 후 3시간 교반하고, 폐산분리하고 수세하였다. After completion of the dropwise addition was stirred for 3 hours, and the spent acid separated and washed with water. 공비 탈수 후에 50 질량％ KOH 수용액 21.82 g(0.194 mol)을 가하고, 150℃에서 철야가열 환류를 행하였다. After azeotropic dehydration was added a 50 mass% KOH aqueous solution of 21.82 g (0.194 mol), it was subjected to heating overnight under reflux at 150 ℃. 트리메틸클로로실란 35.8 g(0.330 mol), 아세트산칼륨 32.4 g(0.330 mol)으로 중화하고, 여과 후 용제를 감압증류 제거하여, 하기 평균 조성식으로 표시되는 실록산 수지(수지 3)를 합성하였다. Neutralized with trimethylchlorosilane 35.8 g (0.330 mol), potassium acetate in 32.4 g (0.330 mol), and the solvent was evaporated under reduced pressure after filtration, it was synthesized in the siloxane resin (Resin 3) represented by the following average formula. 얻어진 실록산 수지의 GPC에 의한 폴리스티렌 환산의 중량 평균 분자량은 1,850이고, 비닐 당량은 0.161 mol/100 g이었다. And 1850 has a weight average molecular weight in terms of polystyrene by GPC of the obtained siloxane resin, a vinyl equivalent of 0.161 mol / 100 g.
플라스크에 디페닐디메톡시실란 5,376 g(22.0 mol), 아세토니트릴 151.8 g을 투입하고, 10℃ 이하까지 냉각하고, 이하의 적하 반응을 내온 10℃ 이하에서 행하였다. The flask diphenyl dimethoxysilane 5,376 g (22.0 mol), added with acetonitrile, and 151.8 g, were subjected to the cooling, and the internal temperature at 10 ℃ the addition, the reaction of less than to more than 10 ℃. 농황산 303.69 g을 적하하고, 물 940.36 g을 1시간에 적하하고, (HSiMe 2 ) 2 O 2,216 g(16.5 mol)을 적하하고, 철야교반하였다. Concentrated sulfuric acid was added dropwise to 303.69 g, and 940.36 g water was added dropwise in 1 hour, added dropwise to (HSiMe 2) 2 O 2,216 g (16.5 mol) , and stirred overnight. 폐산분리를 행하고, 수세하고, 감압증류 제거를 행하고, 하기 식으로 표시되는 오르가노하이드로젠폴리실록산 1을 합성하였다. Subjected to spent acid separated, washed with water, subjected to reduced pressure distillation to remove, to synthesize the organohydrogenpolysiloxane represented by the following formula 1. 수소 가스 발생량은 90.32 ml/g(0.403 mol/100 g)이었다. Hydrogen generation amount was 90.32 ml / g (0.403 mol / 100 g). 플라스크에 크실렌 1,000 g, 물 5,014 g을 가하고, 페닐트리클로로실란 2,285 g(10.8 mol), 비닐디메틸클로로실란 326 g(2.70 mol), 크실렌 1,478 g을 혼합한 것을 적하하였다. In the flask and 1,000 g of xylene, 5,014 g of water, was added dropwise to a mixture phenyl trichloro silane 2,285 g (10.8 mol), vinyl dimethylchlorosilane 326 g (2.70 mol), xylene, 1,478 g. 적하 종료 후 3시간 교반하고, 폐산분리하고 수세하였다. After completion of the dropwise addition was stirred for 3 hours, and the spent acid separated and washed with water. 공비 탈수 후에 KOH 6 g(0.15 mol)을 가하고, 150℃에서 철야가열 환류를 행하였다. After azeotropic dehydration was added KOH 6 g (0.15 mol), it was subjected to heating overnight under reflux at 150 ℃. 트리메틸클로로실란 27 g(0.25 mol), 아세트산칼륨 24.5 g(0.25 mol)으로 중화하고, 여과 후 용제를 감압증류 제거하여, 하기 평균 조성식으로 표시되는 실록산 수지(수지 4)를 합성하였다. Neutralized with trimethylchlorosilane 27 g (0.25 mol), potassium acetate in 24.5 g (0.25 mol) and, by then filtering the solvent was evaporated under reduced pressure, was synthesized in the siloxane resin (Resin 4) represented by the following average formula. 얻어진 실록산 수지의 GPC에 의한 폴리스티렌 환산의 중량 평균 분자량은 1,820이고, 비닐 당량은 0.131 mol/100 g이었다. And 1820 has a weight average molecular weight in terms of polystyrene by GPC of the obtained siloxane resin, a vinyl equivalent of 0.131 mol / 100 g.
비닐메틸디메톡시실란 264.46 g(2.00 mol), 디페닐디메톡시실란 733.08 g(3.00 mol), 3-글리시독시프로필트리메톡시실란 1,181.5 g(5.00 mol), IPA 2,700 ml를 투입하고, 25 질량％ 테트라메틸암모늄히드록시드 수용액 82.00 g, 물 740 g을 가하여 혼합하고, 3시간 교반하였다. Vinyl methyl dimethoxysilane 264.46 g (2.00 mol), diphenyl dimethoxysilane 733.08 g (3.00 mol), 3- glycidoxypropyltrimethoxysilane 1,181.5 g (5.00 mol), IPA 2,700 ml added to, and 25 parts by mass % aqueous solution of tetramethylammonium hydroxide 82.00 g, and the mixture was added to water 740 g, and stirred for 3 hours. 톨루엔을 가하고, 인산이수소나트륨 수용액으로 중화하고, 수세를 행하고, 감압증류 제거를 행하여, 하기 평균 조성식으로 표시되는 접착 부여제를 합성하였다. Was added to toluene, the acid and neutralized with sodium hydrogen aqueous solution, subjected to water washing, subjected to a reduced pressure distillation to remove, ethylamine adhesion providing agent represented by the following average formula. 합성예 1 내지 4, 6으로 제조한 각 성분 및 이하의 성분을 표 1에 나타내는 조성으로 혼합하여 실리콘 수지 조성물을 제조하였다. By mixing the composition shown below and a component of the respective components prepared in Synthesis Examples 1 to 4 and 6 in Table 1 to prepare a silicon resin composition. 합성예 5 및 상기 성분을 표 1에 나타내는 비율로 혼합하여 실리콘 수지 조성물을 제조하였다. Mixed in a ratio that represents the Synthesis Example 5, and the components shown in Table 1 to prepare a silicon resin composition. 실시예 1 내지 5 및 비교예 1, 2의 실리콘 수지 조성물을, 150℃/4시간으로 가열 성형(세로×가로×두께=110 mm×120 mm×2 mm)하여 경화물을 형성하고, 외관을 육안으로 관찰하였다. Examples 1-5 and Comparative Example 1, the silicone resin composition of the 2, 150 ℃ / 4 time Heating molded into (length × width × thickness = 110 mm × 120 mm × 2 mm) to form a cured product, the appearance It was visually observed. 또한, JIS K 6301에 준거하여 인장 강도, 경도(A형 및 D형 스프링 시험기를 이용하여 측정) 및 신장율을 측정하였다. Further, a (measured using a type A and a D type spring tester) and elongation were measured tensile strength and hardness in accordance with JIS K 6301. 또한, JIS K 7129에 준거하여 리시법(장치명 리시사 L80-5000)에 의해 투습도를 측정하였다. In addition, the water vapor permeability was measured by the receiving method (device name Lee suggests L80-5000) in accordance with JIS K 7129. 또한, 상기 실시예 1 내지 5 및 비교예 1, 2의 실리콘 수지 조성물의 경화물로 밀봉한 광 반도체 장치를 제작하였다. In addition, to prepare an optical semiconductor device sealed with the Examples 1-5 and Comparative Example 1, a cured product of the silicone resin composition of the two. 저면에 두께 2 ㎛의 은 도금을 실시한 구리제 리드 프레임을 배치한 컵상의 LED용 프리몰드 패키지(3 mm×3 mm×1 mm, 개구부의 직경 2.6 mm)에 대하여, 감압 하에서 Ar 플라즈마(출력 100 W, 조사 시간 10초) 처리를 행하여, 상기 저면의 상기 리드 프레임에 InGaN계 청색 발광 소자의 전극을 은 페이스트(도전성 접착제)를 이용하여 접속함과 함께, 상기 발광 소자의 카운터 전극을 금 와이어로 카운터 리드 프레임에 접속하고, 각종 부가 경화형 실리콘 수지 조성물을 패키지 개구부에 충전하여, 60℃에서 1시간, 추가로 150℃에서 4시간 경화시켜 밀봉하였다. A thickness of the bottom 2 ㎛ is under a reduced pressure with respect to the LED pre-molded package for on a cup arranged to copper lead frames subjected to plating (3 mm × 3 mm × 1 mm, diameter 2.6 mm in opening) Ar plasma (output 100 subjected to W, irradiation time 10 seconds), processing, with the box connection to the electrode of the InGaN-based blue light emitting element to the lead frame of the bottom are used the paste (conductive adhesive), a counter electrode of the light emitting element by the gold wire a counter connected to the lead frame and by filling the various types of the addition curing type silicone resin composition in a package opening, in one hour, added at 60 ℃ at 150 ℃ was sealed by curing for 4 hours. 이와 같이 하여 얻어진 LED 장치를 25 mA의 전류를 흘려 점등시키면서 10 ppm의 농도로 황화수소를 발생시키고, 100℃ 황화수소 분위기 하에서 100시간 방치한 후, 패키지 내의 은 도금 표면 근방의 변색 정도를 육안으로 조사하였다. Thus while lighting the LED devices obtained under flowing of 25 mA current to generate the hydrogen sulfide at a concentration of 10 ppm, and then allowed to stand for 100 hours in a 100 ℃ hydrogen sulfide atmosphere in the package is examined discoloration degree in the vicinity of the coated surface with the naked eye . 또한, 제작한 LED 장치 5개를 이용하여, 온도 사이클 시험(-40℃×10분간↔ 100℃×10분간을 200 사이클)과, 60℃/90％ RH 하에서 500시간 LED 점등 시험을 행하여, 패키지 계면의 접착 불량, 균열의 유무 및 변색의 유무를 육안으로 관찰하였다. Further, by using the manufacturing LED apparatus 5, subjected to a temperature cycle test (-40 ℃ × 10 bungan ↔ 100 ℃ cycles × 10 bungan 200) and, 60 ℃ / 500 hours LED lighting test under 90% RH, the package the presence or absence of the presence and color change of interfacial adhesion failure, cracking was visually observed. 이들의 결과를 표 1에 나타내었다. Their results are shown in Table 1. 상기 표 1에 나타낸 바와 같이, 본 발명의 실리콘 수지 조성물의 경화물은 투습성이 낮아, 황화 시험에서도 변색이 발생하지 않았다. As shown in Table 1, the lower the cured product of the silicone resin composition of the present invention is a moisture-permeable and did not cause a color change in the test sulfide. 또한, 신뢰성 시험을 행하더라도, 균열, 박리의 발생은 보이지 않았다. In addition, even if carried out reliability testing, cracks did not occur in the peel. 본 발명의 실리콘 수지 조성물은 일반적인 페닐계 실리콘을 이용한 조성물에 비하여 가스 투과성이 낮은 경화물을 제공하여, 내가스투과성이 우수한 광 반도체 장치를 제공할 수 있어, 광 반도체 소자 밀봉용으로서 바람직하게 사용된다. Silicone resin composition of the present invention is to provide a light gas-permeable lower storage than the composition using the general phenyl-based silicone, the gas permeability can be provided an excellent optical semiconductor device, it is preferably used as an optical semiconductor device sealed . 제1항에 있어서, (A) 성분 중의 알케닐기 1몰당 (B) 성분 중의 SiH기가 0.4 내지 4.0몰이 되는 양의 (B) 성분을 함유하는 실리콘 수지 조성물. 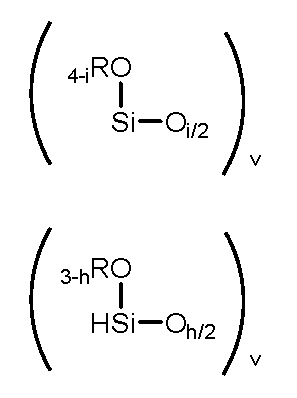 Claim 1 wherein, (A) component in the alkenyl group per mole of (B) SiH group-containing silicone resin composition of the component (B) in the amount of 0.4 to 4.0 mol of component a. 제1항에 있어서, (B) 성분의 50 내지 100 질량％가 하기 화학식 (3)으로 표시되는 것인 실리콘 수지 조성물. According to claim 1, (B) a silicone resin composition represented by the formula (3) is 50 to 100 mass% of the component. 제1항에 있어서, (A') 하기 화학식 (4)로 표시되는 오르가노폴리실록산을 (A) 및 (B) 성분의 합계 100 질량부에 대하여 0.01 내지 50 질량부 더 포함하는 실리콘 수지 조성물. The method of claim 1 wherein, (A ') to the organopolysiloxane (A) and (B) 0.01 to 50 parts by mass of the silicone resin composition further comprises 100 parts by mass of the sum of component represented by the formula (4). 제1항에 있어서, (D) 접착 부여제를 더 포함하는 실리콘 수지 조성물. According to claim 1, (D) a silicone resin composition further comprises an adhesion-imparting agent. 제1항에 있어서, (E) 축합 촉매를 더 포함하는 실리콘 수지 조성물. According to claim 1, (E) a silicone resin composition further comprises a condensation catalyst. 제1항에 있어서, (F) 무기질 충전제를 더 포함하는 실리콘 수지 조성물. According to claim 1, (F) a silicon resin composition further comprises an inorganic filler. 제1항에 있어서, 두께 1 mm의 경화물의 수증기 투과율이 15 g/m 2 ?day 이하인 실리콘 수지 조성물. The method of claim 1, wherein the water vapor permeability of the cured product having a thickness of 1 mm is 15 g / m 2? Day or less silicone resin composition. 제1항 내지 제8항 중 어느 한 항에 있어서, 광 반도체 소자의 밀봉용인 실리콘 수지 조성물. Any one of claims 1 to 8 according to any one of claims, wherein the sealing acceptable silicone resin composition of the optical semiconductor element. 제1항 내지 제8항 중 어느 한 항에 기재된 실리콘 수지 조성물의 경화물로 광 반도체 소자가 밀봉된 광 반도체 장치. Any one of claims 1 to 8, the optical semiconductor device sealed optical semiconductor device of a cured product of the silicone resin composition according to any one of items.